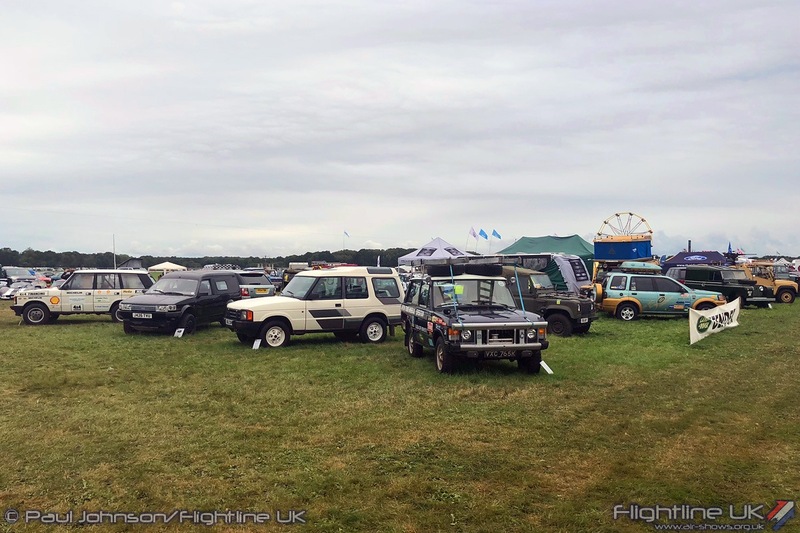 The 14th Wings and Wheels Show took place over the August Bank Holiday weekend. 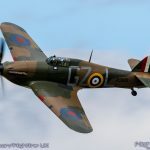 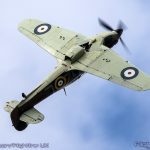 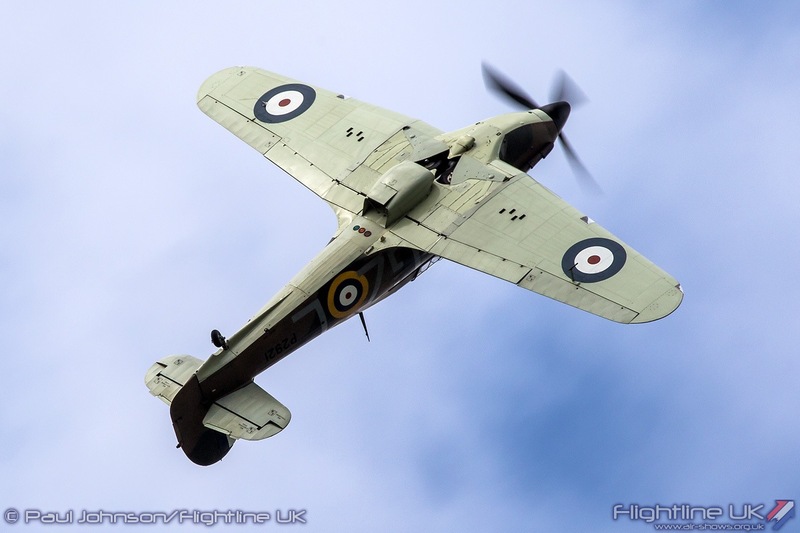 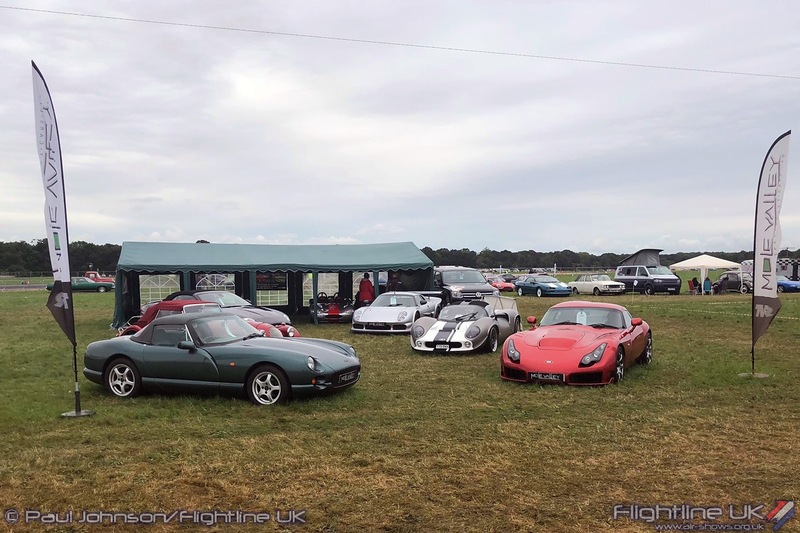 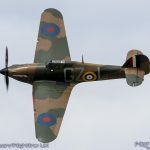 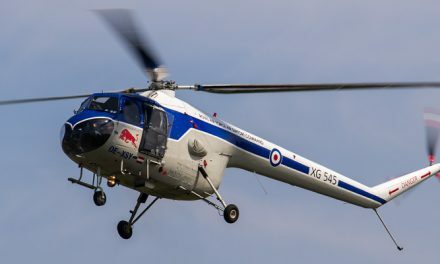 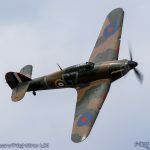 As ever, it was a veritable feast of aerial and motoring action in the heart of the Surrey countryside supporting the Brooklands Museum Trust and Help for Heroes. 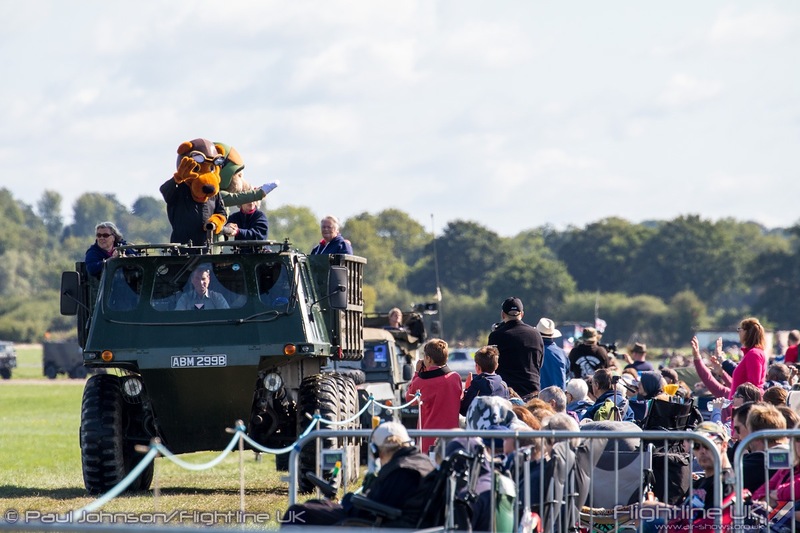 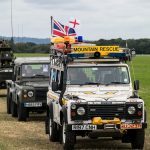 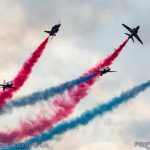 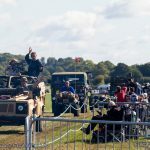 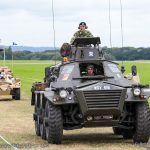 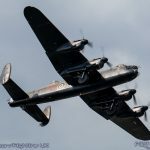 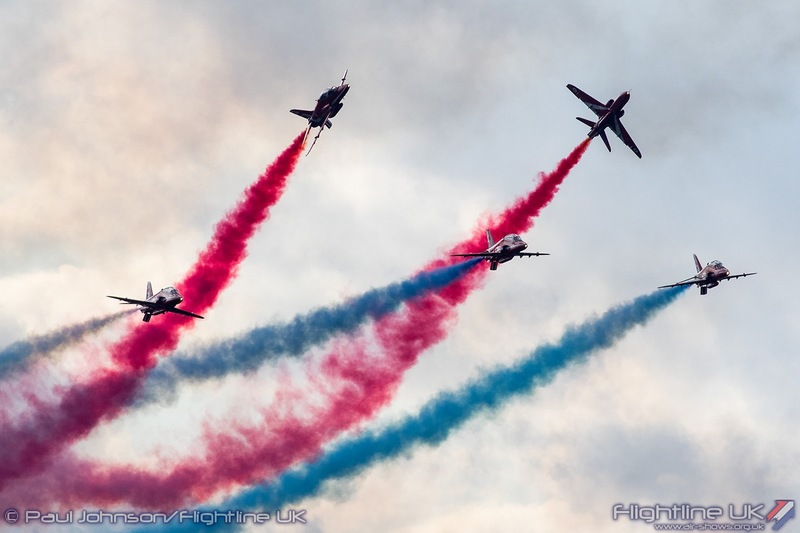 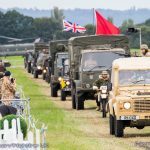 Supporting the aerial and motoring action was arena packing full with military vehicles, classic cars plus after-show live music which continued right into the evening. 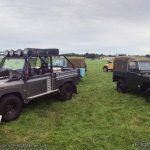 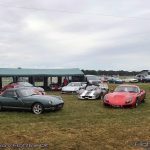 Sadly however, the show contended with some very British weather on the second day which curtailed events significantly. 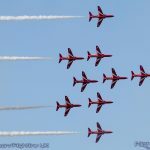 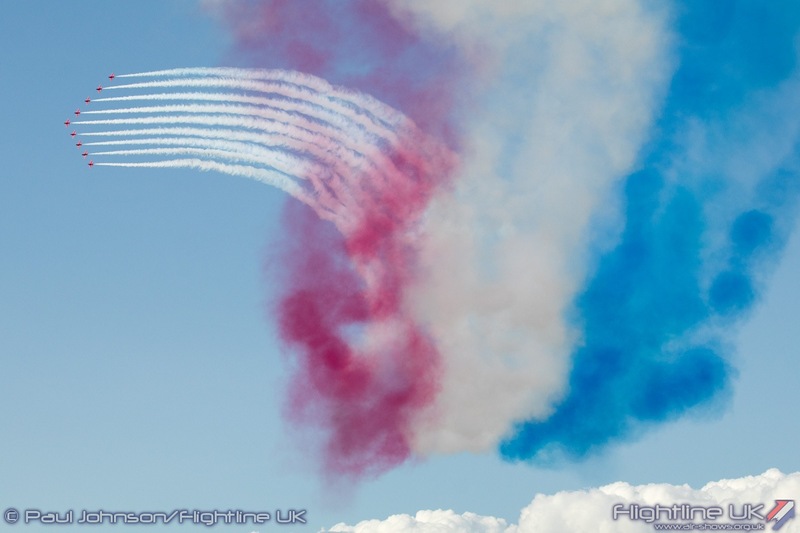 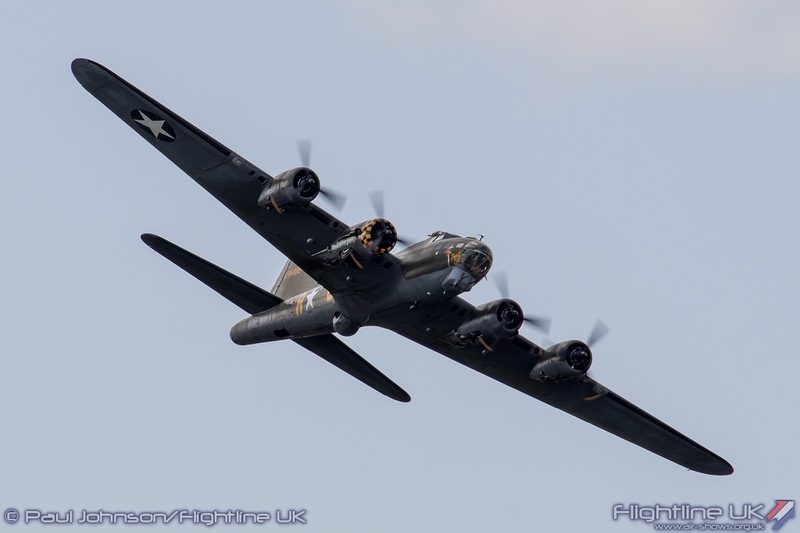 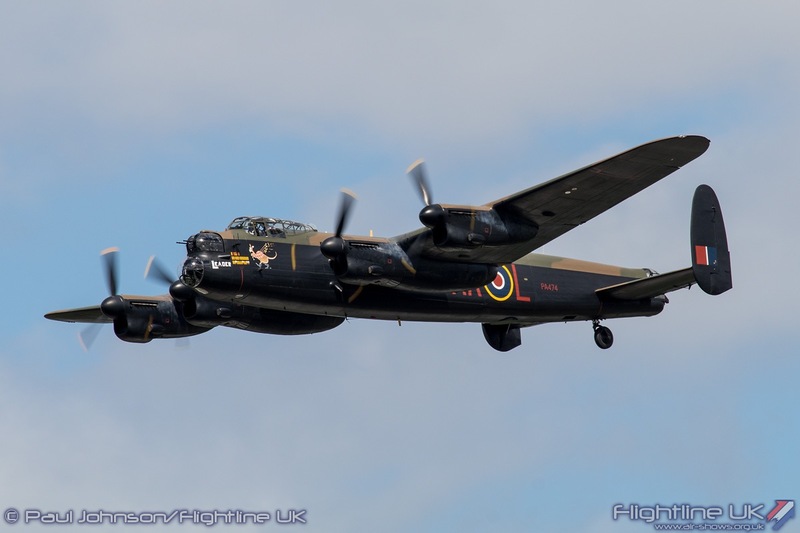 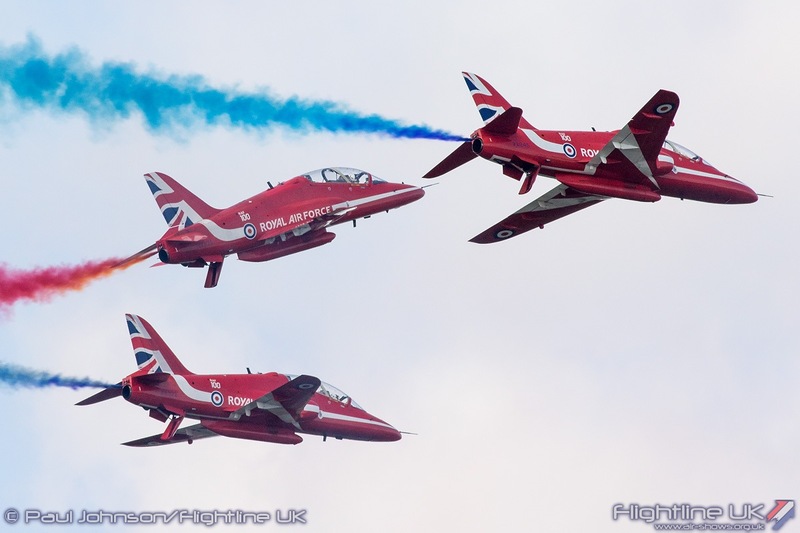 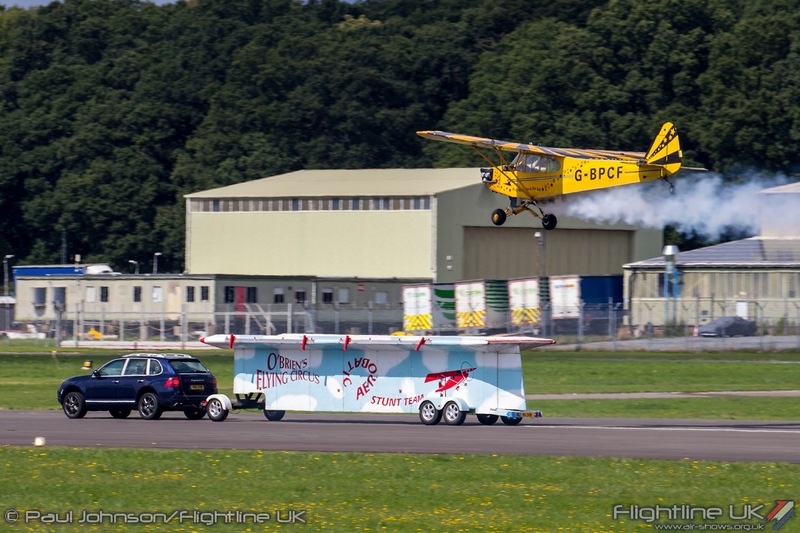 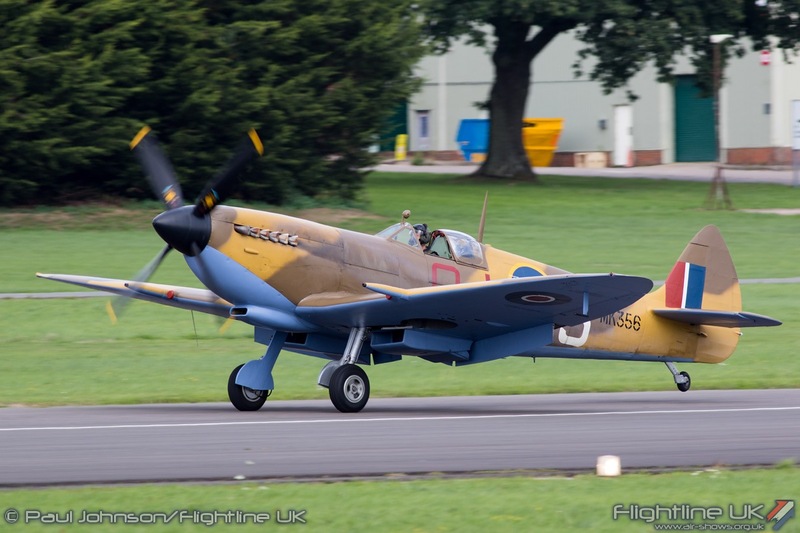 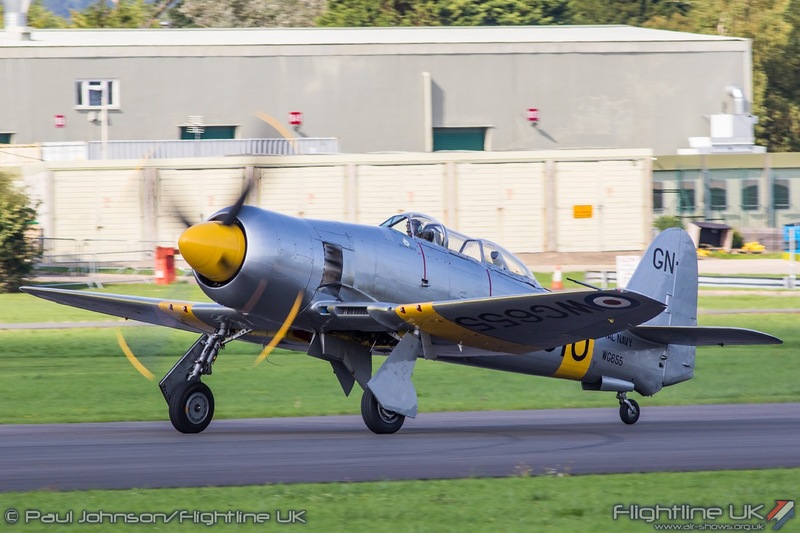 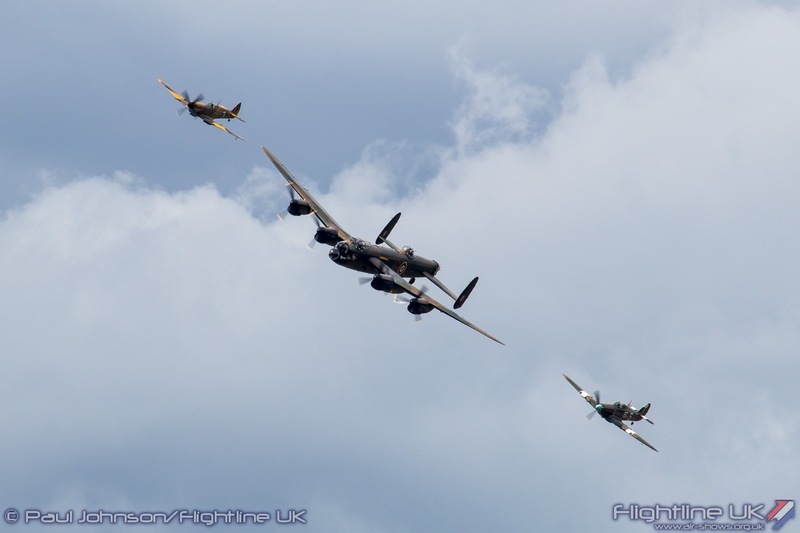 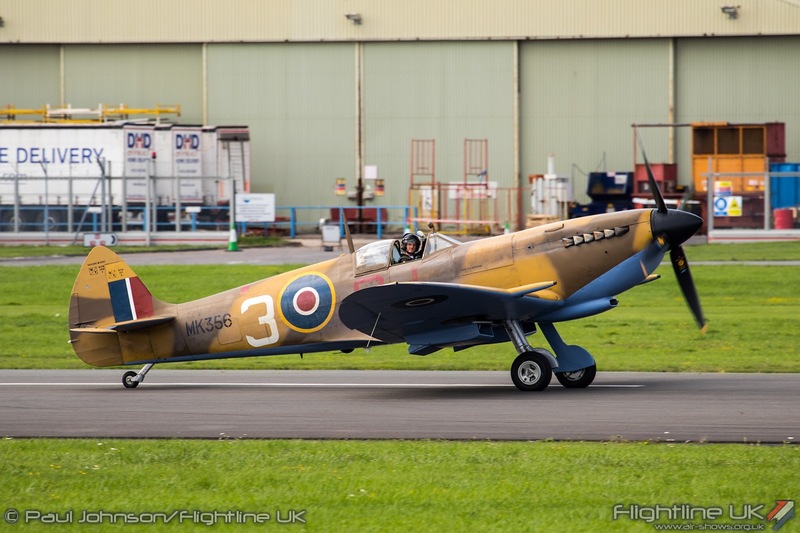 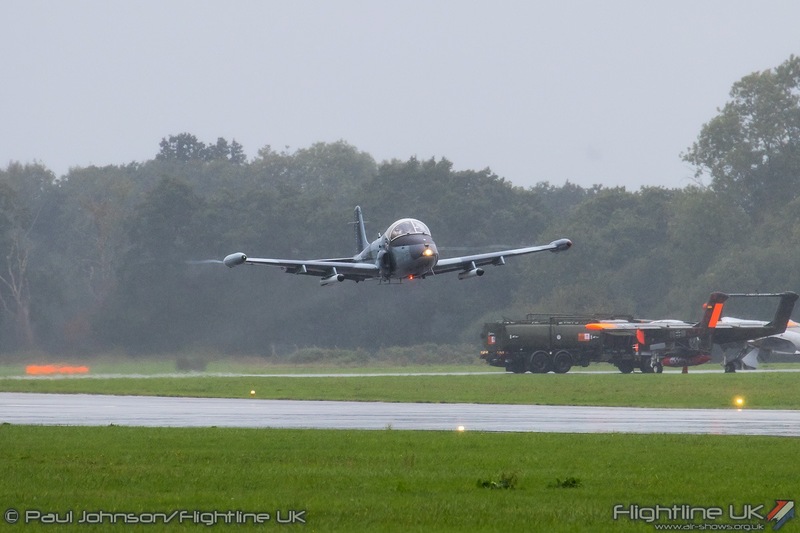 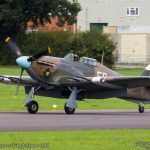 Paul Johnson/Flightline UK reports. 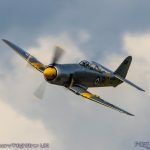 All photography and video by the author. 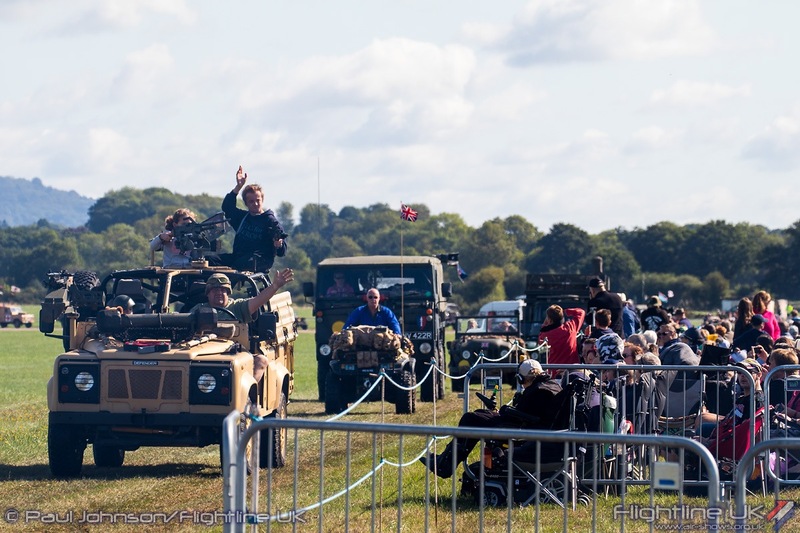 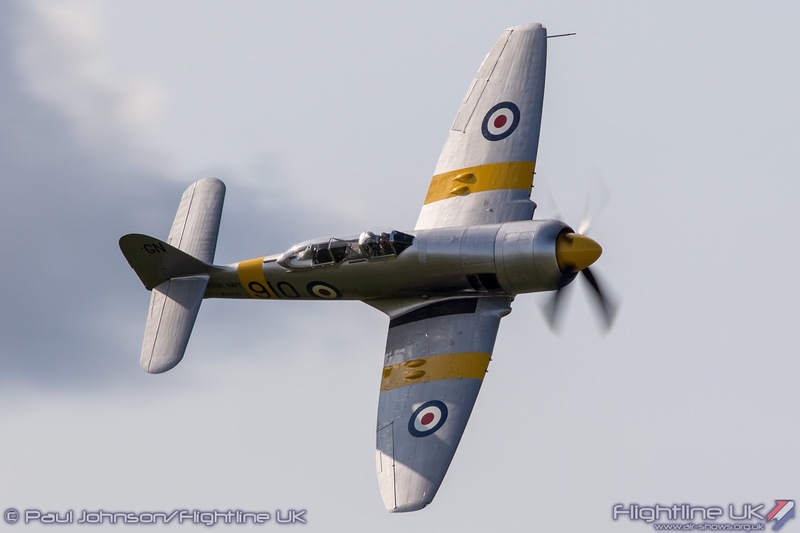 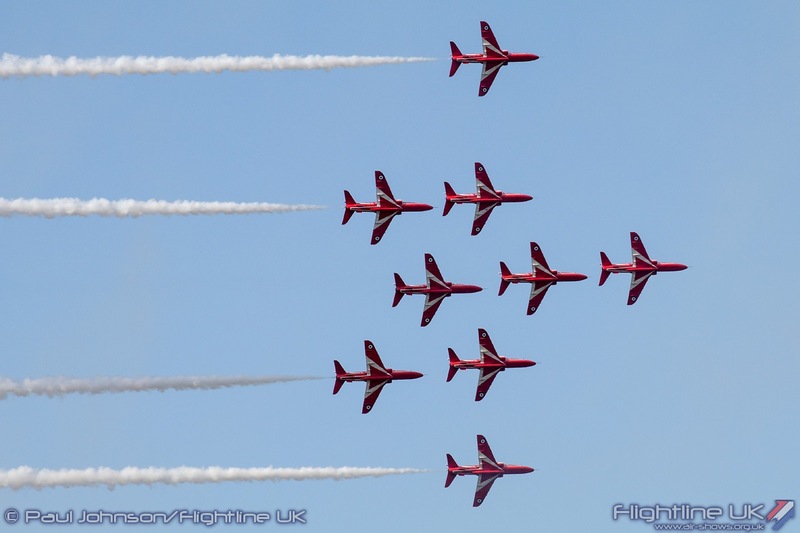 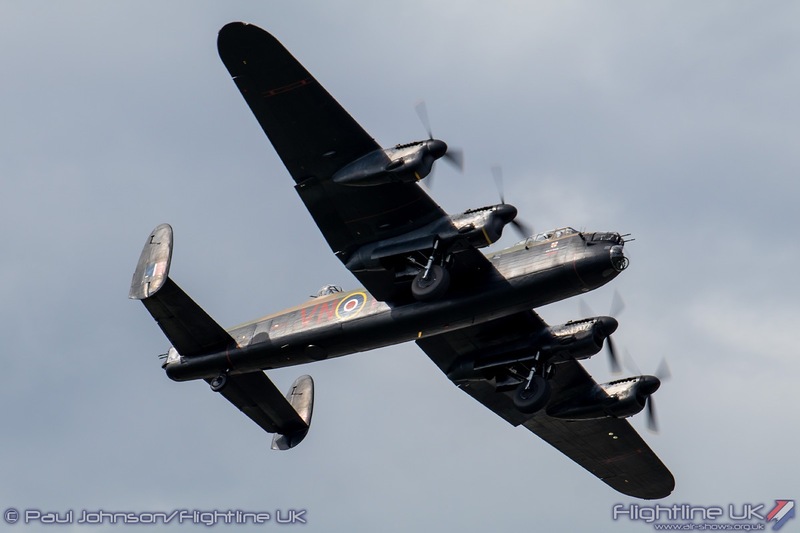 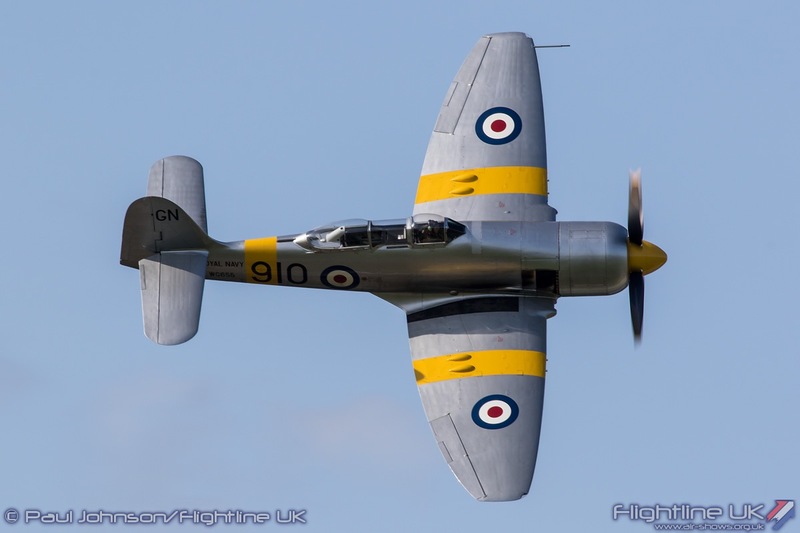 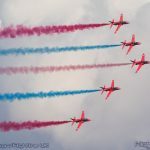 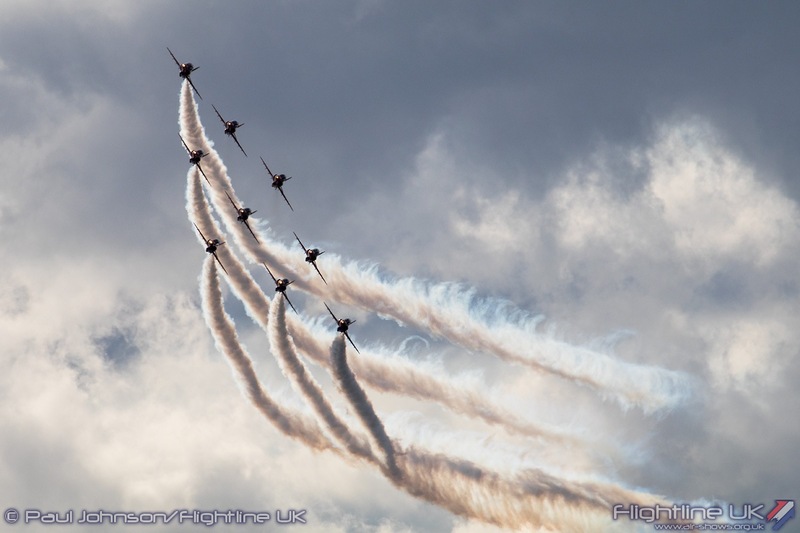 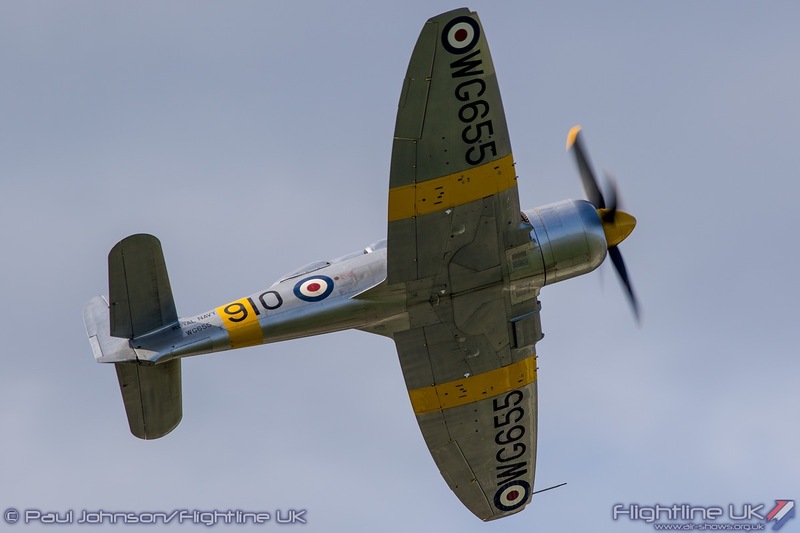 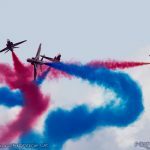 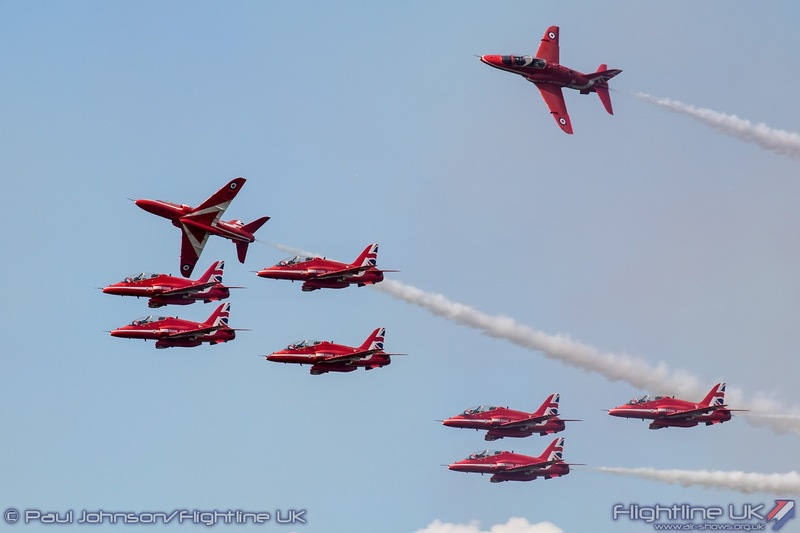 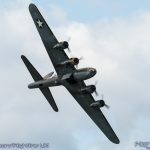 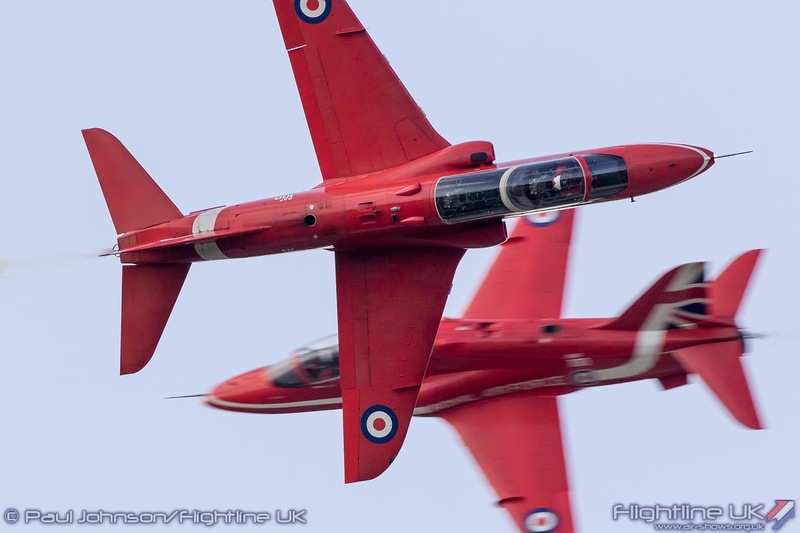 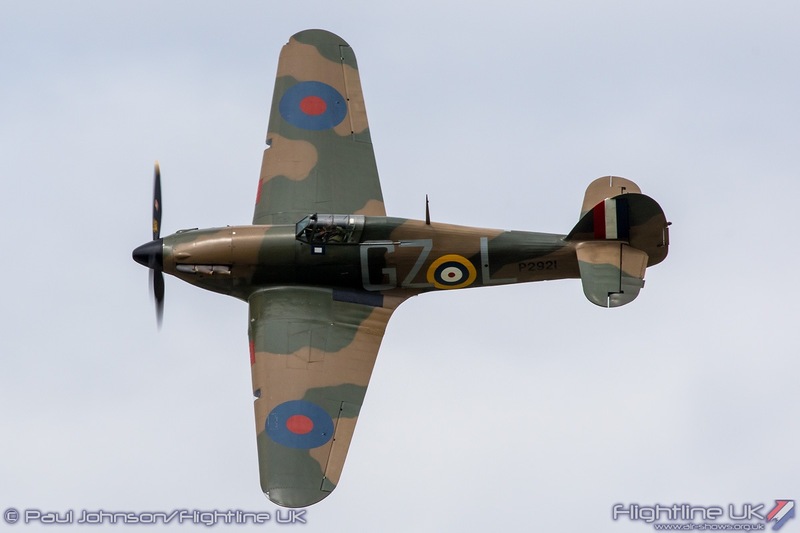 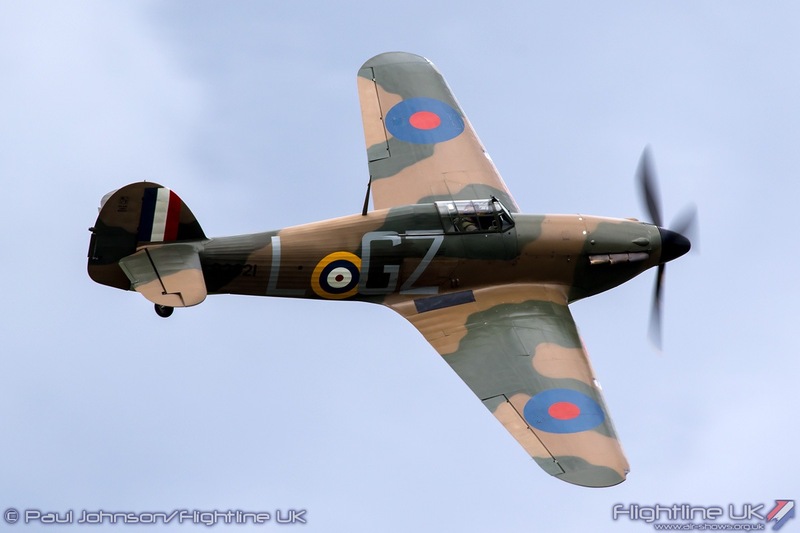 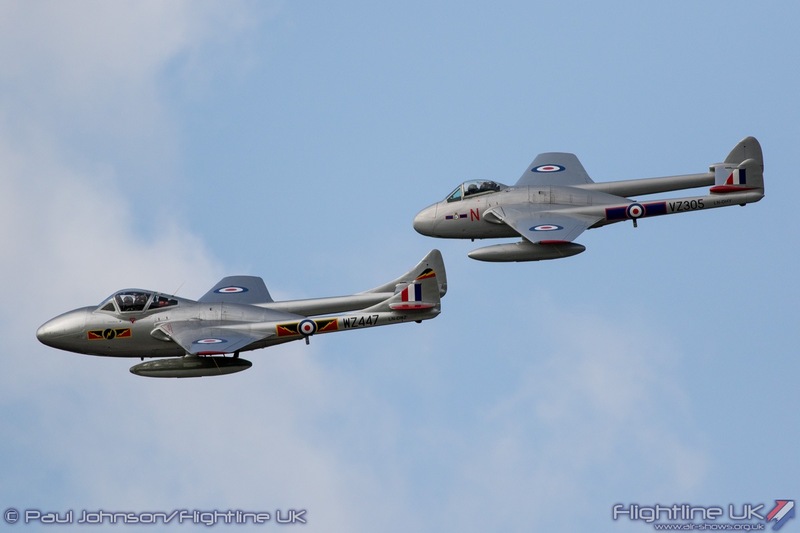 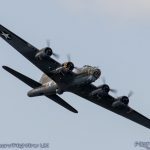 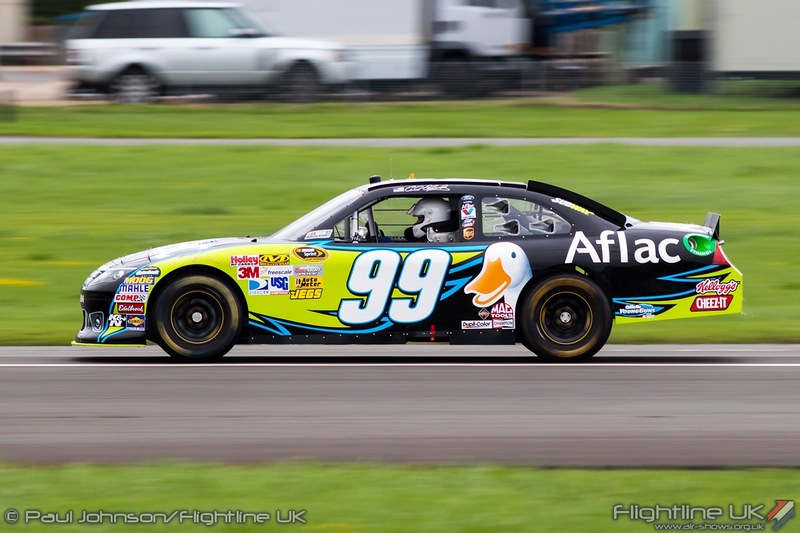 Wings and Wheels at Dunsfold Park is a very popular and much loved event in the Surrey area. 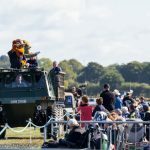 This year it attracted another big audience over the two days which many in the crowd being loyal fans of the show who have attended for many years. 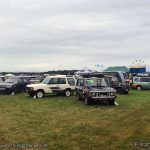 I count myself among them. 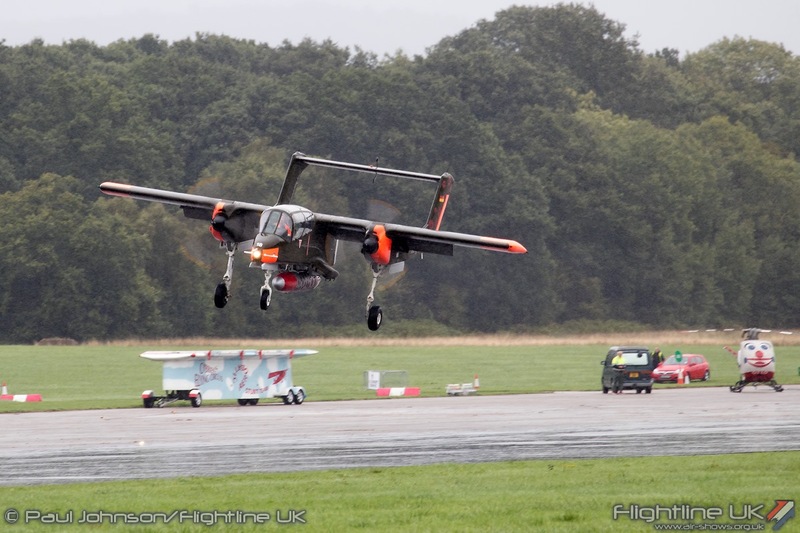 Dunsfold is and has always been fun and relaxed show whatever the weather. 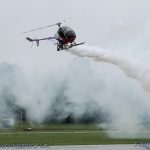 Flying and aviation may be the centrepiece to the event, but it shares the limelight equally with the motoring. 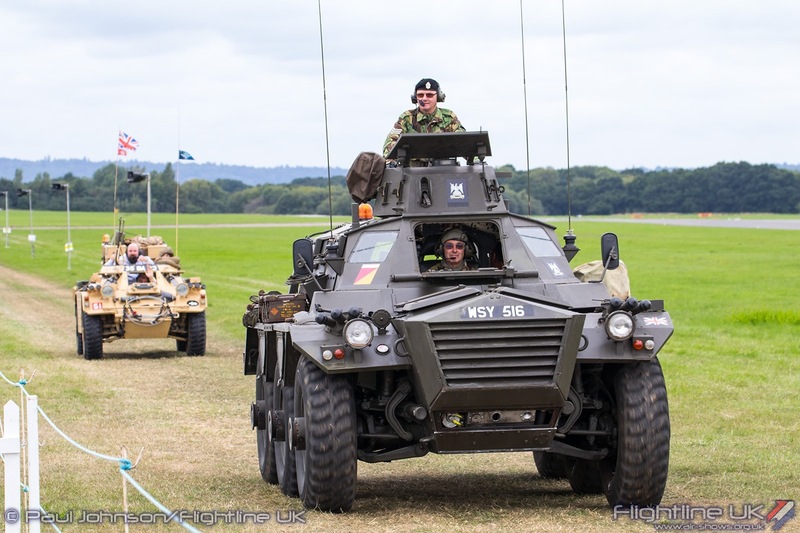 The arena as it always has been was packed with classic car clubs and military vehicles. 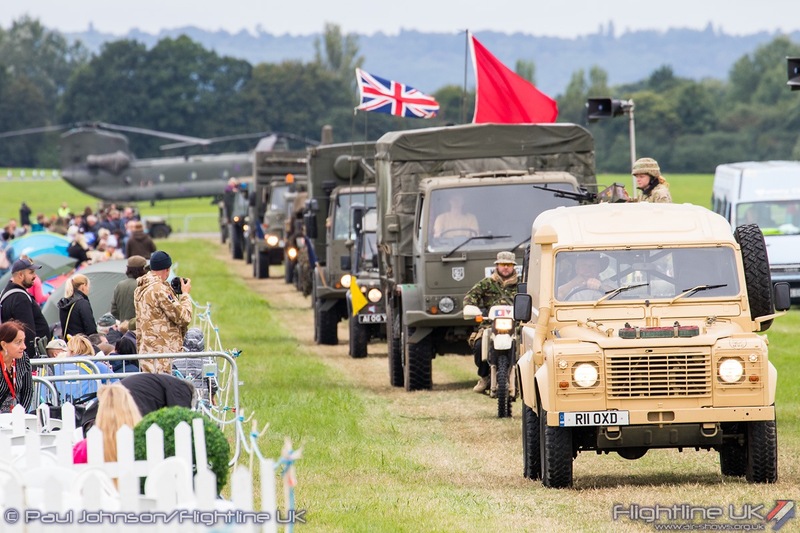 The variety was incredible even for those who don’t really follow the classic or military vehicle scene too closely. 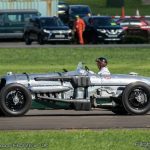 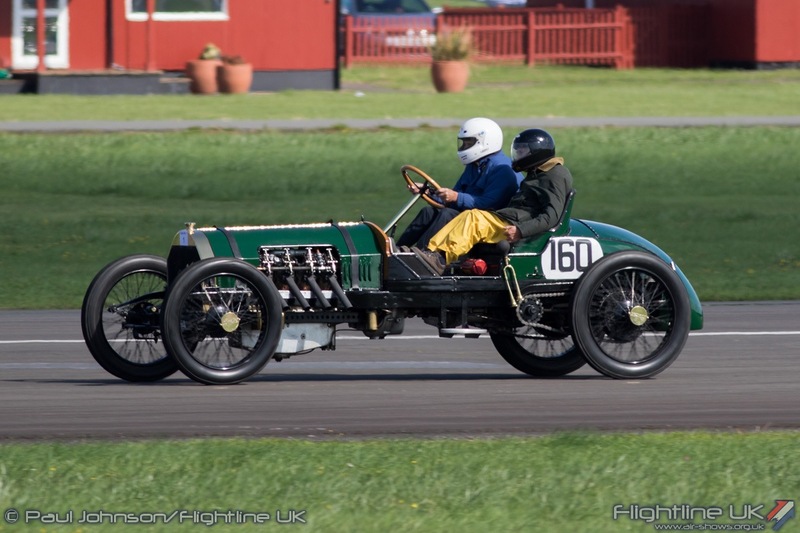 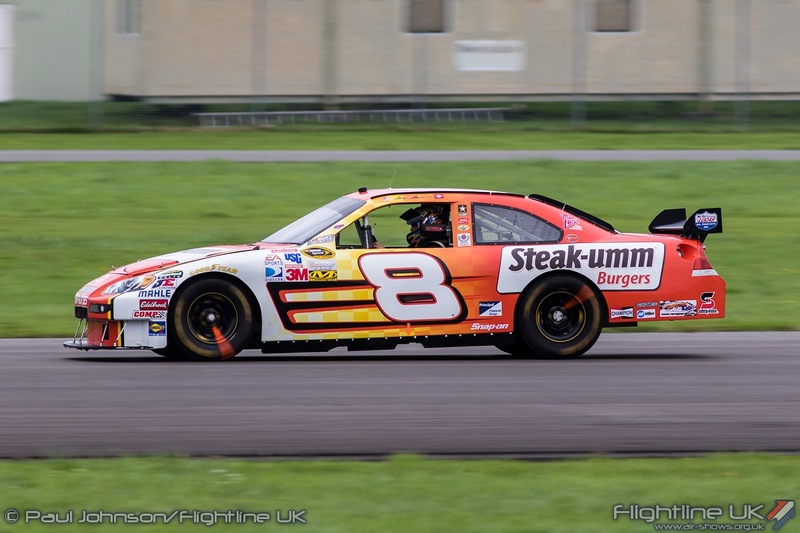 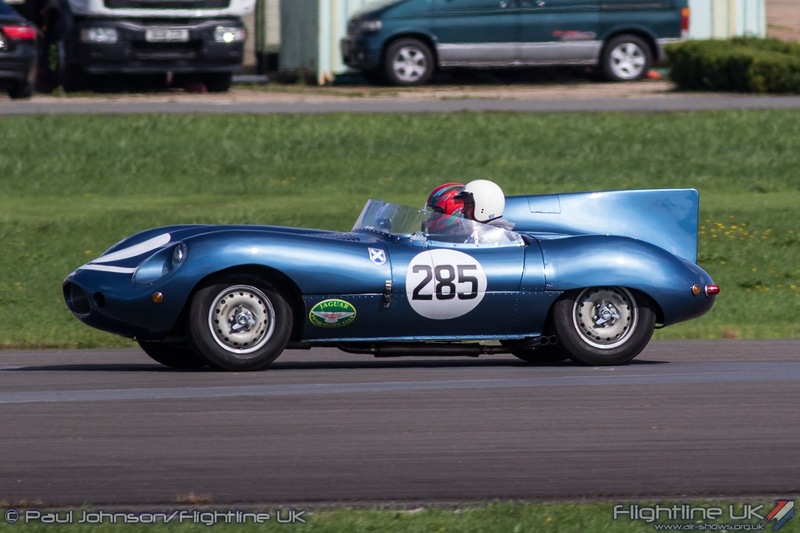 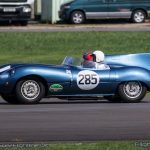 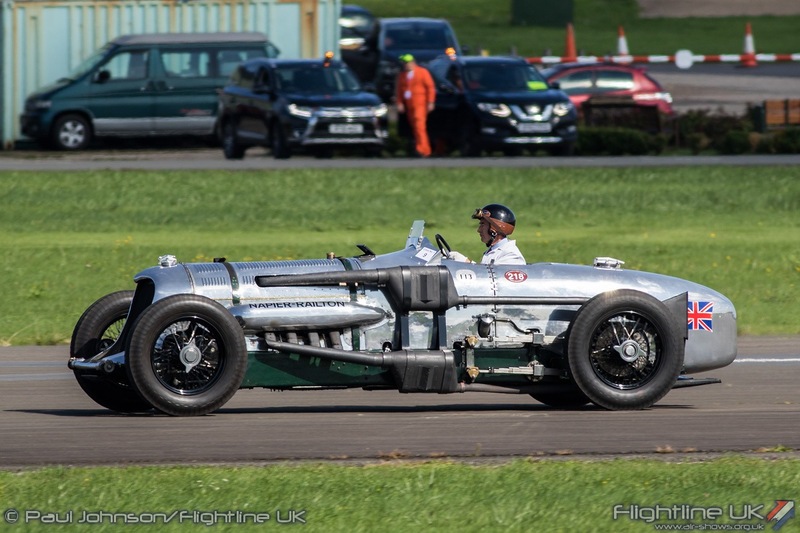 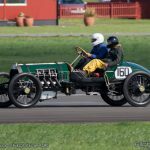 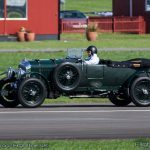 Each day of Wings and Wheels also sees Motoring demonstrations on the main runway which sees historic racers, supercars, sports cars, motorbikes and even the occasional sidecar racer charge up Dunsfold’s runway taking in a small portion of the world famous Top Gear test track. 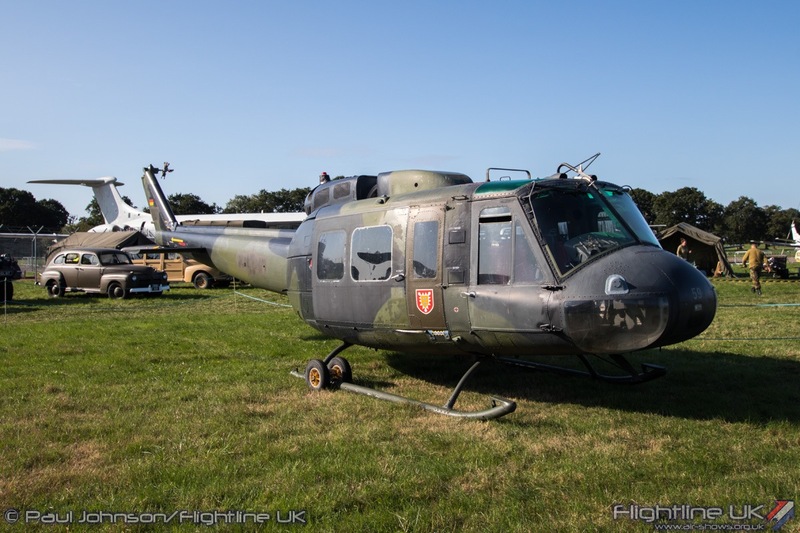 Dunsfold Park is an active airfield throughout the year and also often features as a film set for sequences featuring airfield and aircraft. 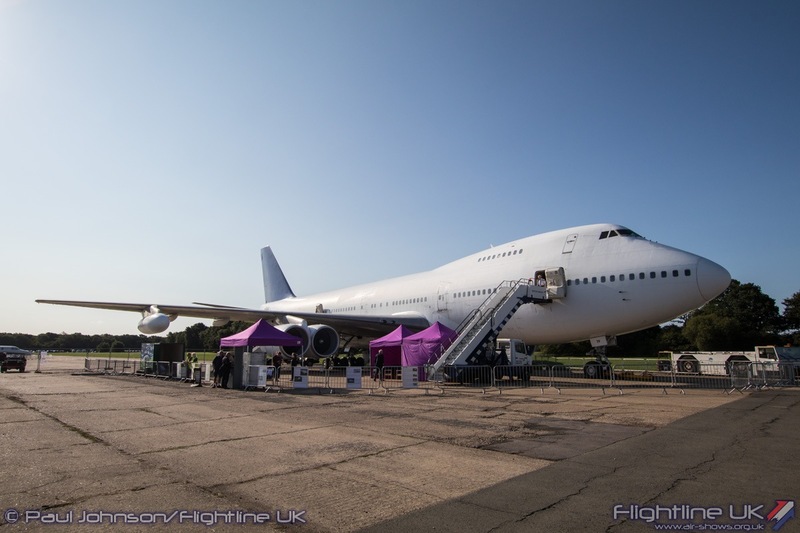 Dominating the airfield backdrop is the famous Dunsfold Boeing 747 which more recently has been joined by Brooklands Museum’s BAC VC-10 K3. 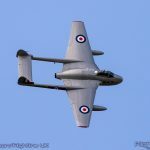 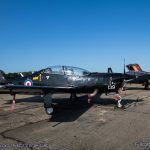 The collection of aircraft kept at Dunsfold also includes some historical Hawker types including a Hunter T7 and Sea Hawk FB6. 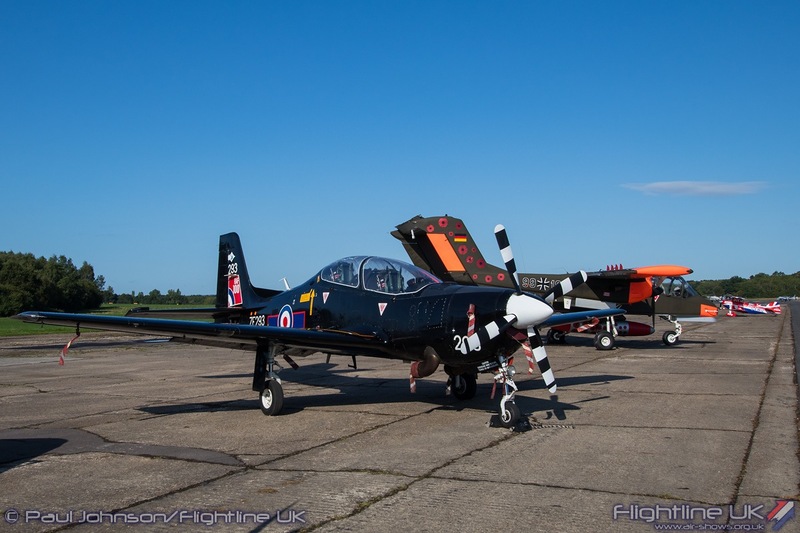 Joining the based aircraft for the RAF100 year was a Shorts Tucano T1 from 72(R) Squadron wearing its centenary fin flash which continued the Wings and Wheels tradition of hosting military aircraft on static display. 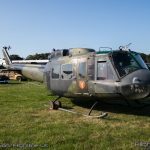 Another unusual addition to the military zone was a Bell UH-1D Iroquios, formally from the German Army. 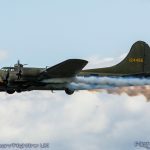 Like the 747, this aircraft is a film prop owned by the based Aces High company who displayed it alongside their Douglas C-47A Skytrain. 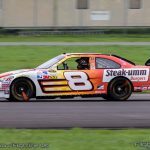 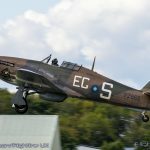 The weather between Saturday and Sunday could not have been more different. 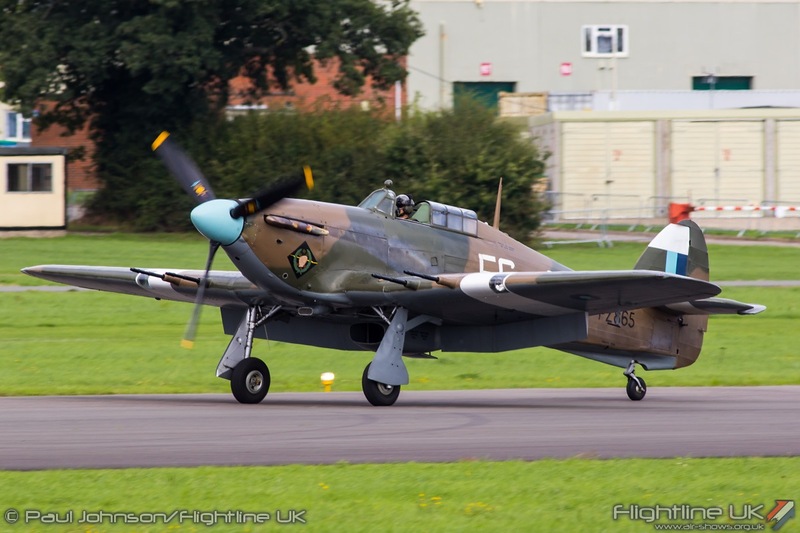 Saturday saw a pleasant late August summer’s day with sunny spells throughout. 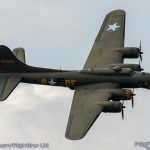 Sunday however saw a deluge of rain arrive by late morning. 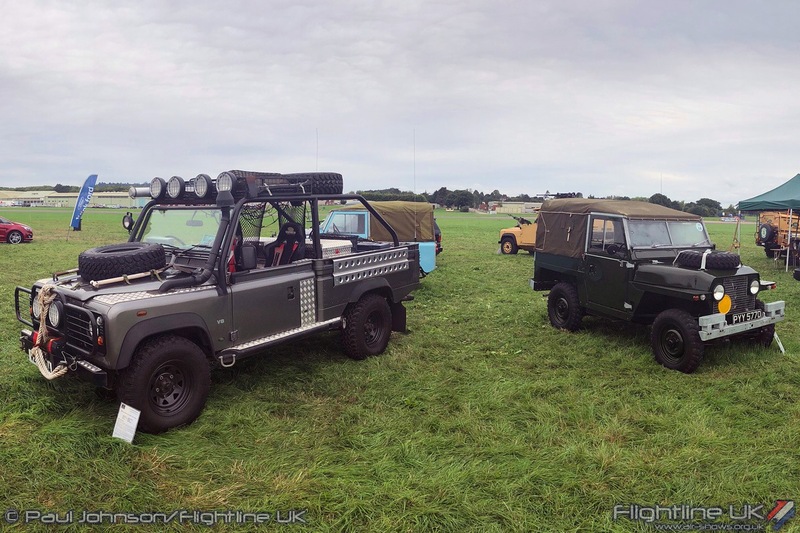 The ever-busy Flying Control Committee had already moved to a contingency plan but even that got whittled down to half a dozen or so displays before the poor weather really set in. 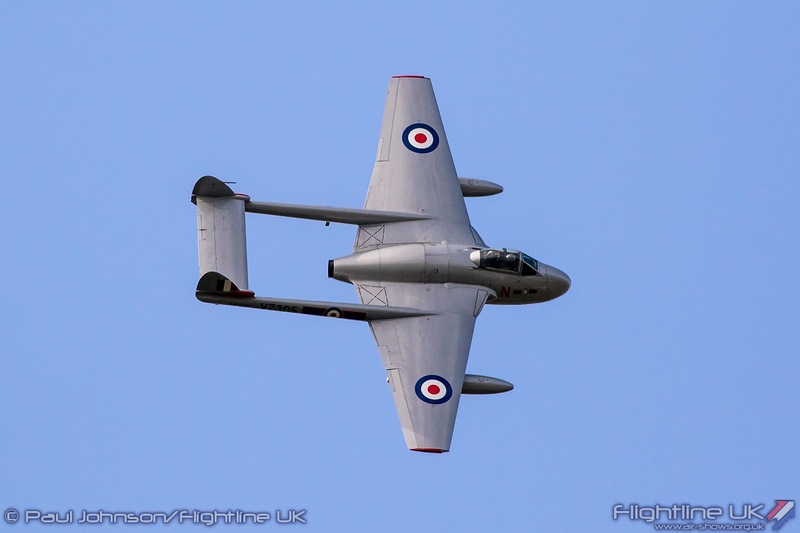 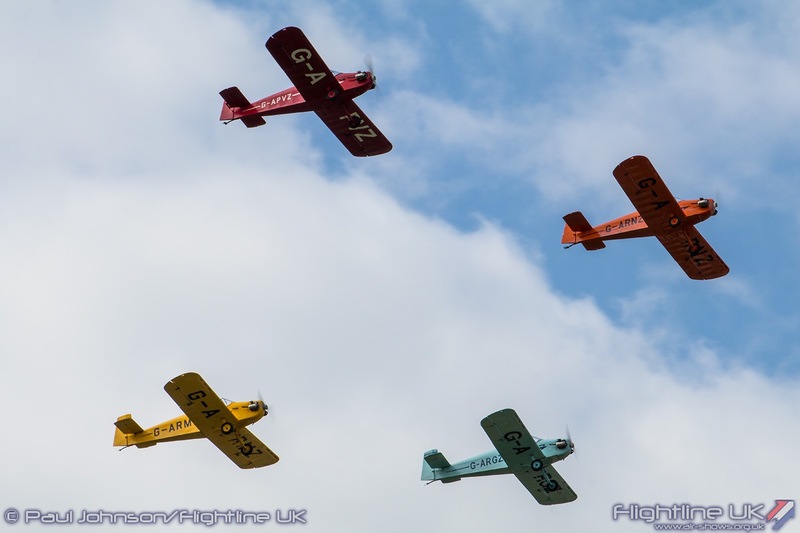 The flying displays on both days were varied and colourful affairs mixing old Dunsfold favourites with new items. 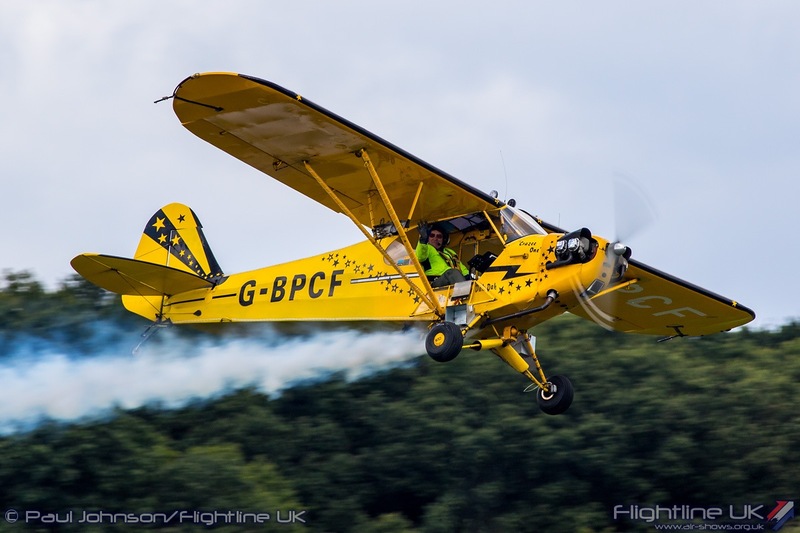 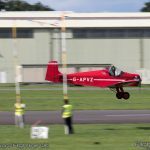 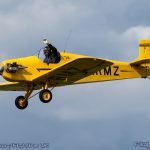 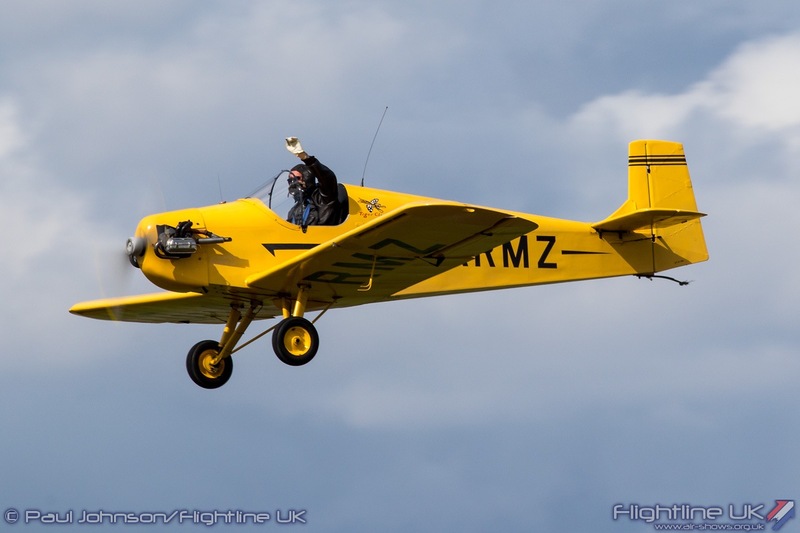 Opening Saturday’s flying was Brendan O’Brien in his modified Piper J3C Cub ‘Crazee One.’ As well as some crazy flying, Brendan also attempted his famous trailer top landings up and down Dunsfold’s runway which is always great fun to watch. 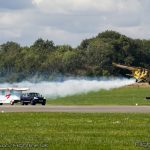 Intially everyone thought Brendan had gone as far as to add a smoke system to the trailer, but it turned out to be the turbo in the tow car slowly destroying itself!! 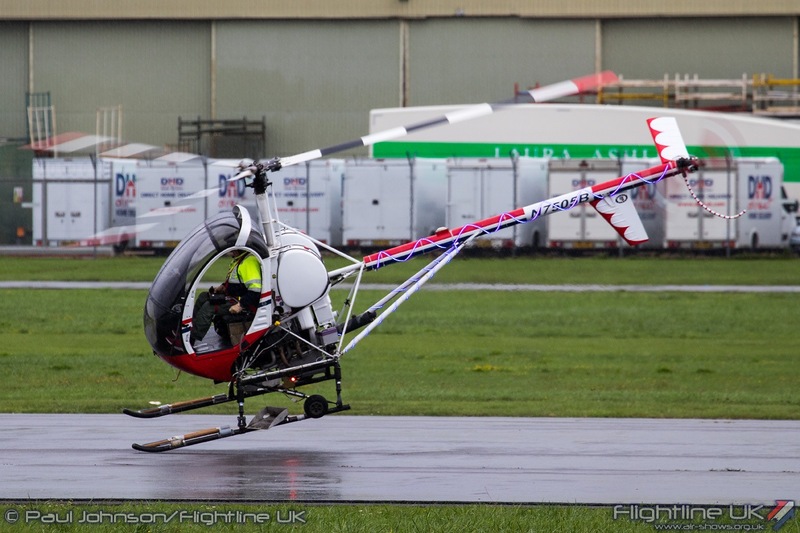 The lack of tow car and the expected rain meant that on Sunday Brendan substituted the Cub for OTTO the Helicopter. 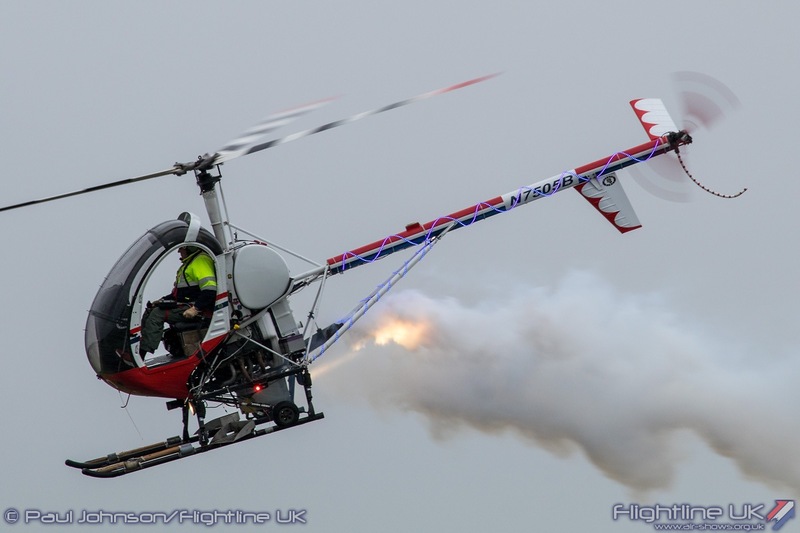 OTTO is actually a Schweizer S300C and was a famous display act on the US display circuit. 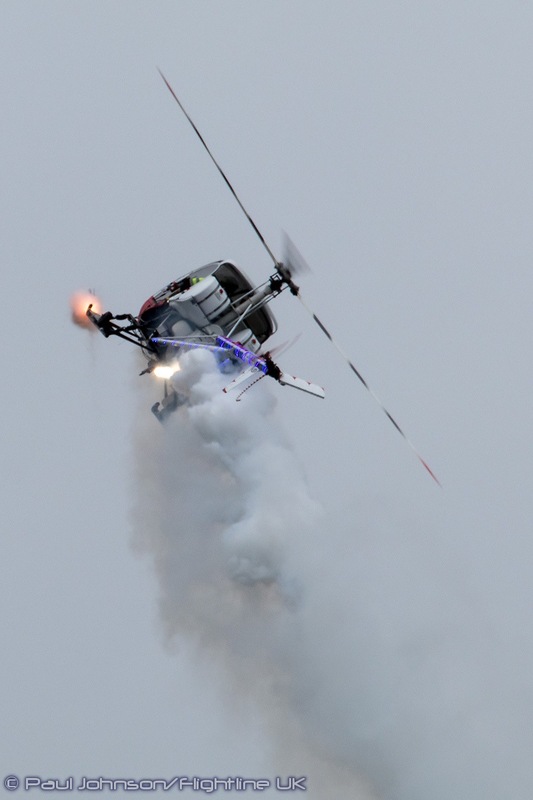 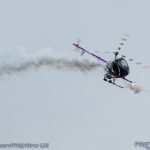 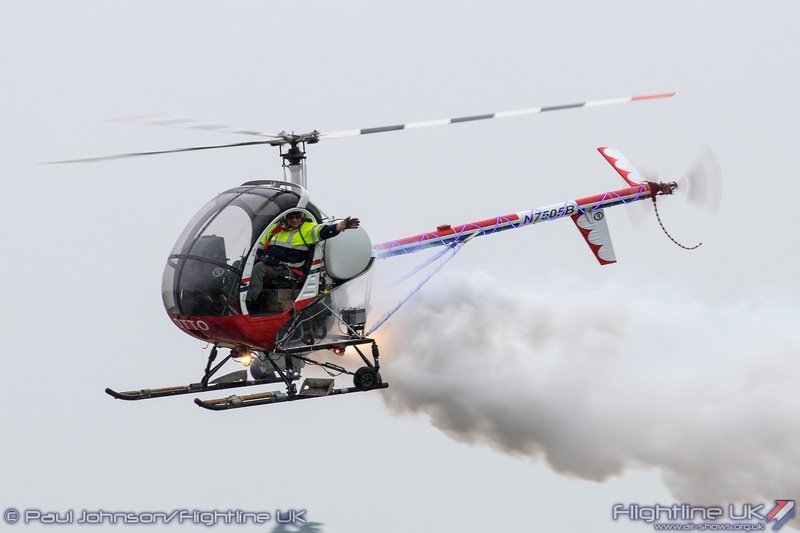 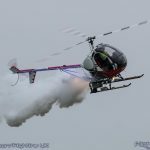 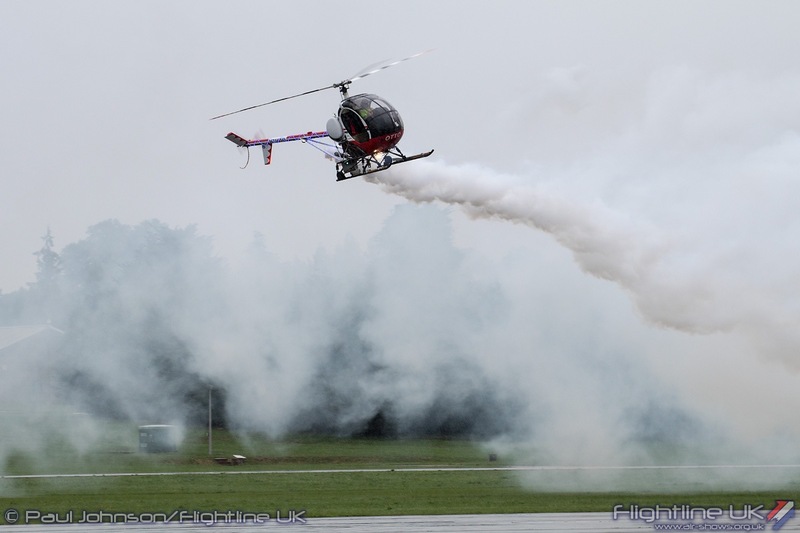 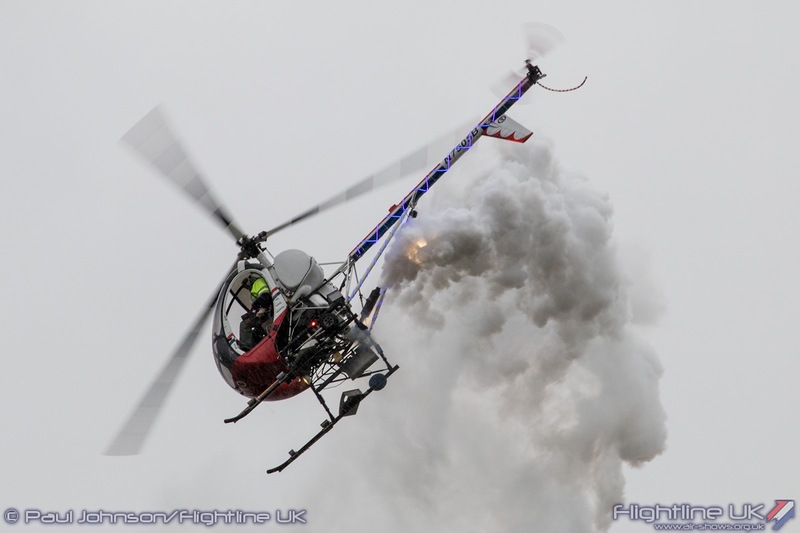 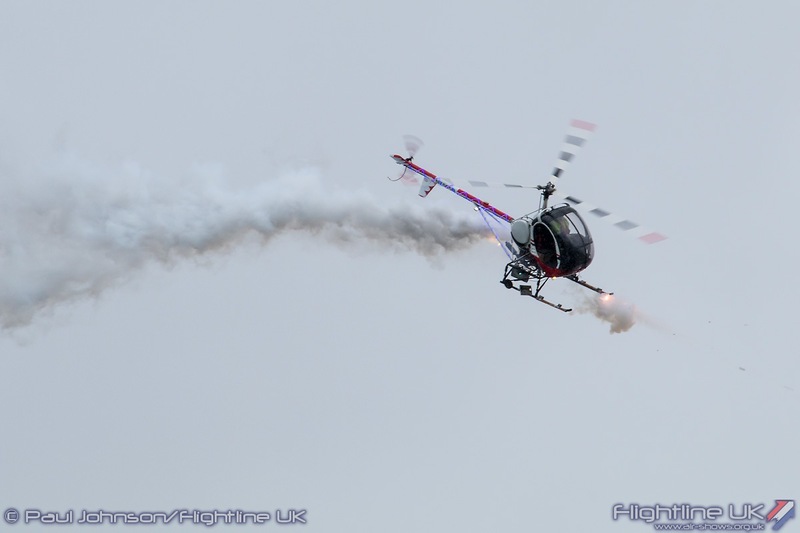 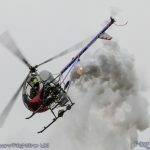 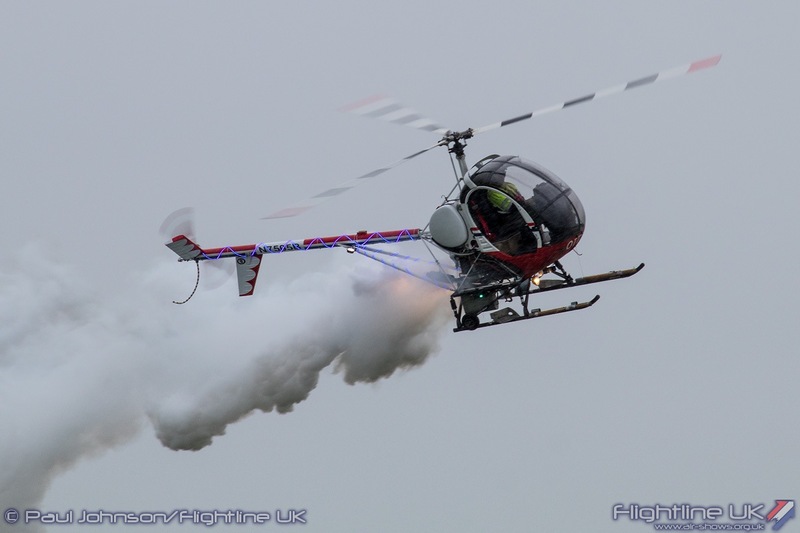 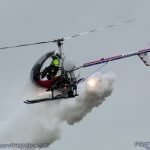 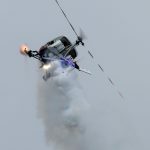 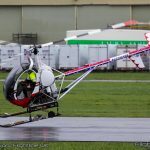 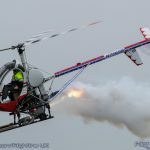 Despite the rain, Brendan put on a superb display of “Chopperbatics” with smoke trailing from the engine and fireworks firing from OTTO’s landing skids – great fun! 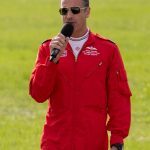 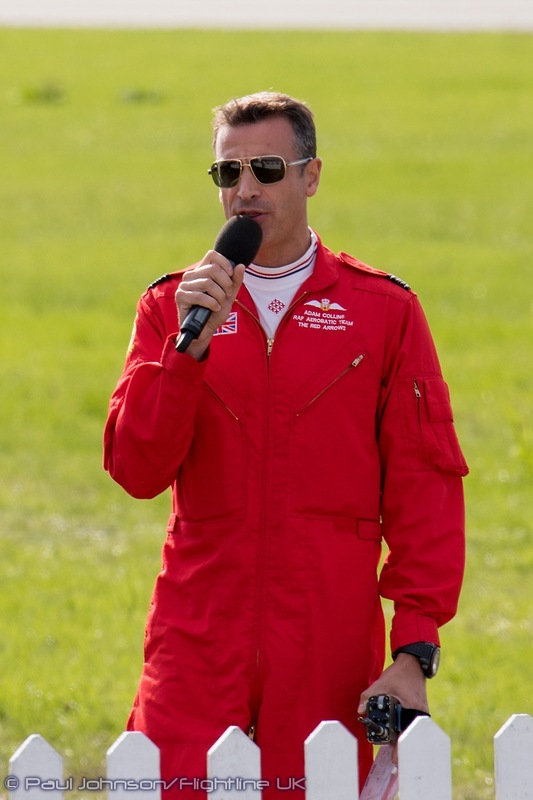 Brendan is an important part of Wings and Wheels experience as he’s one half of the legendary commentary team alongside Melvyn Hiscock. 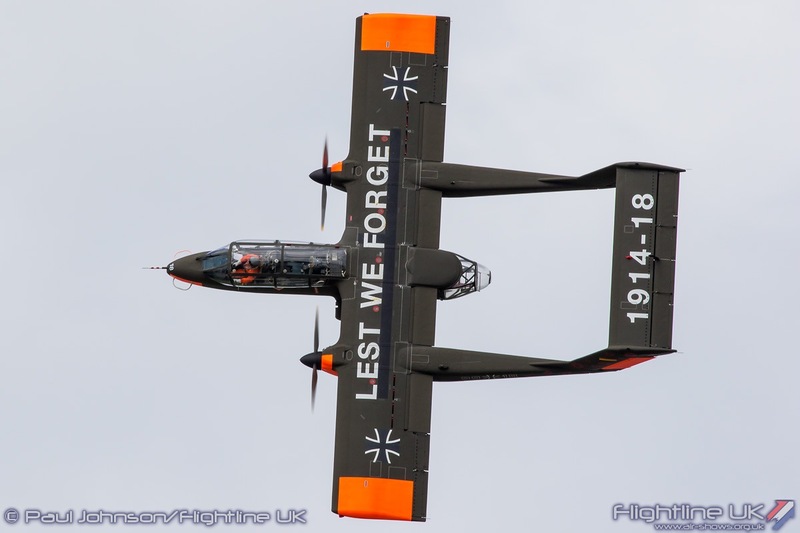 Together, their witty and informative insights into the display aircraft, the pilots and aviation history really do give Wings and Wheels a unique atmosphere and flavour. 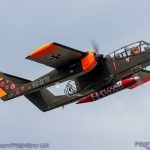 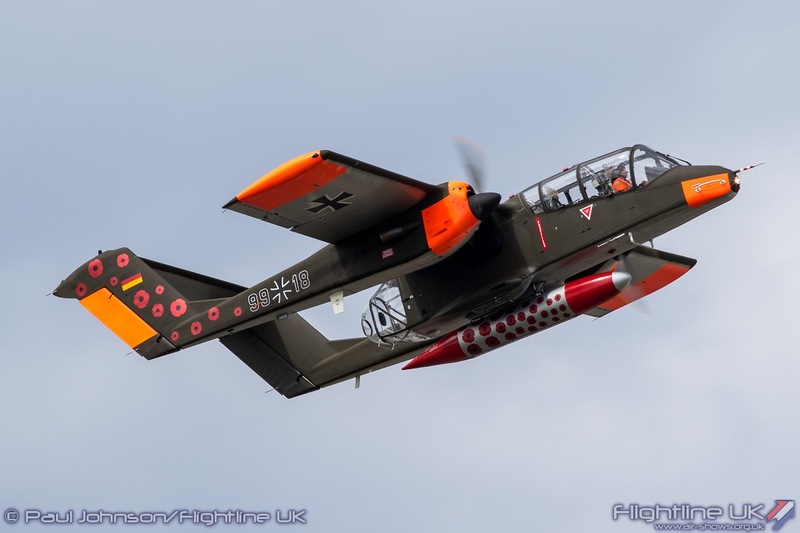 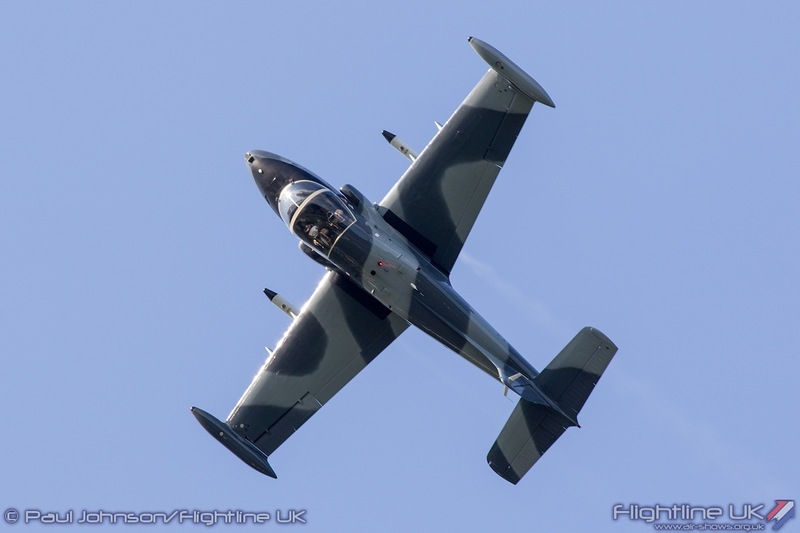 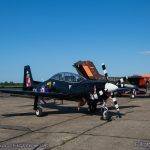 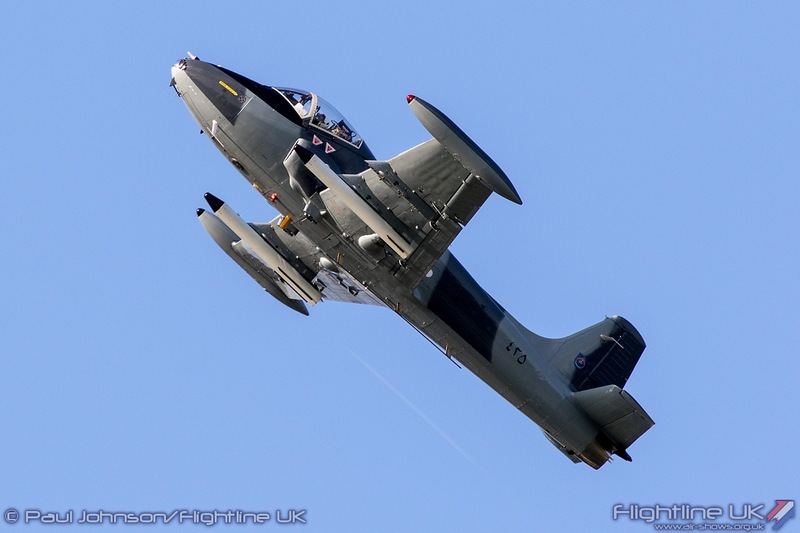 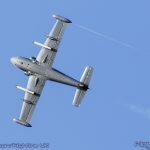 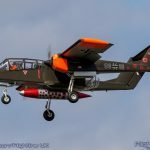 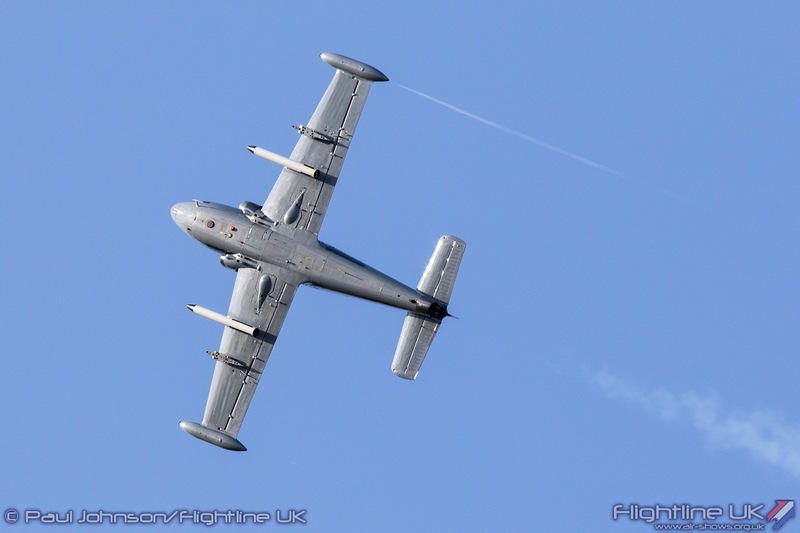 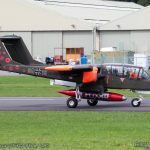 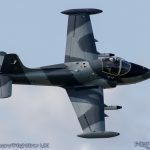 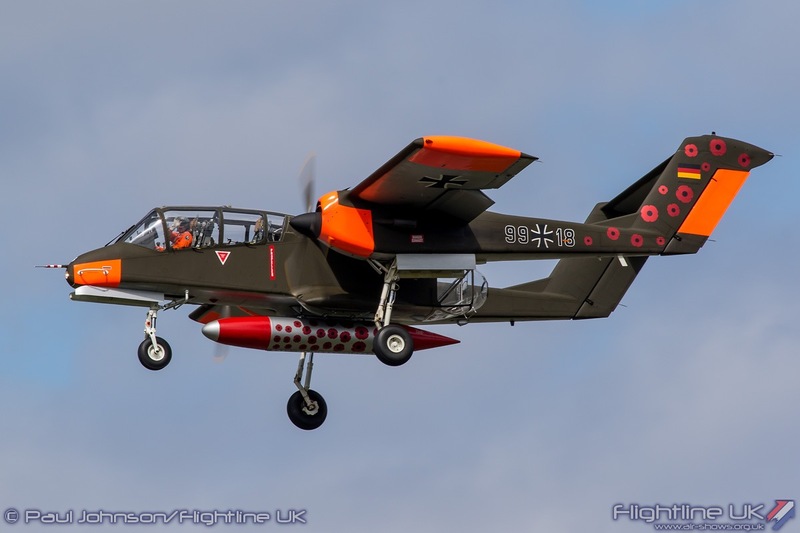 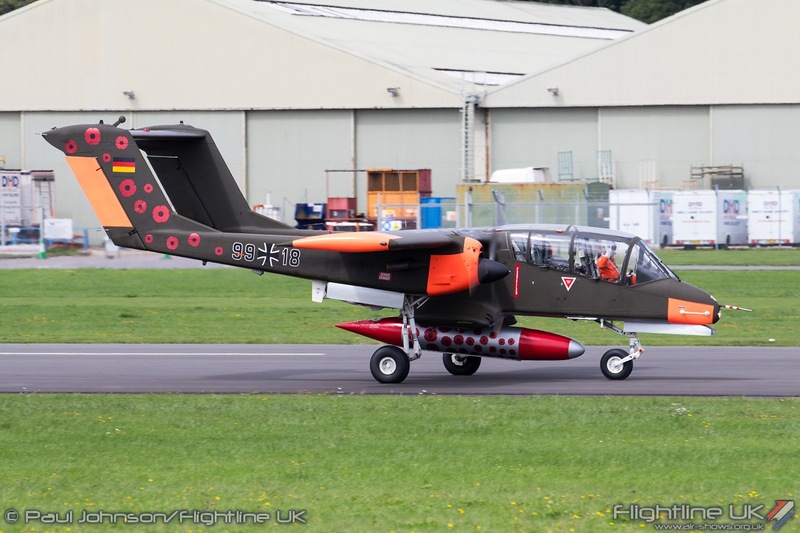 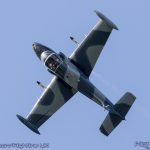 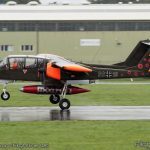 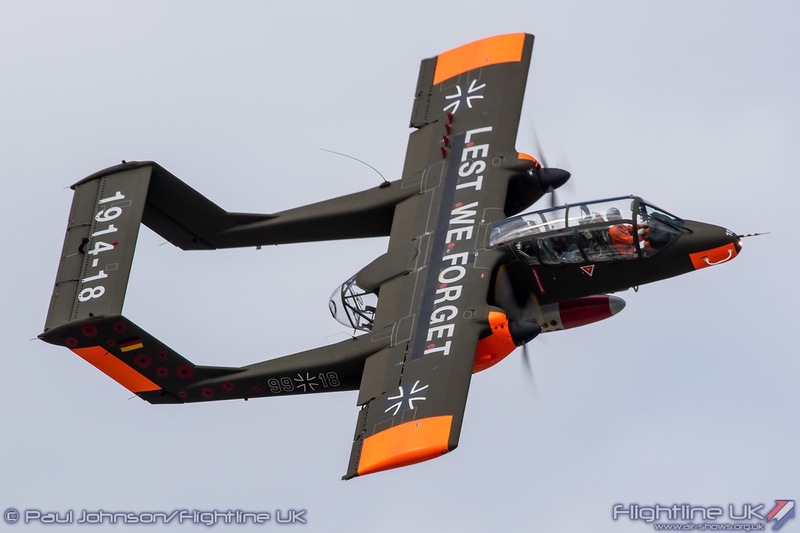 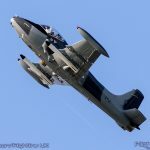 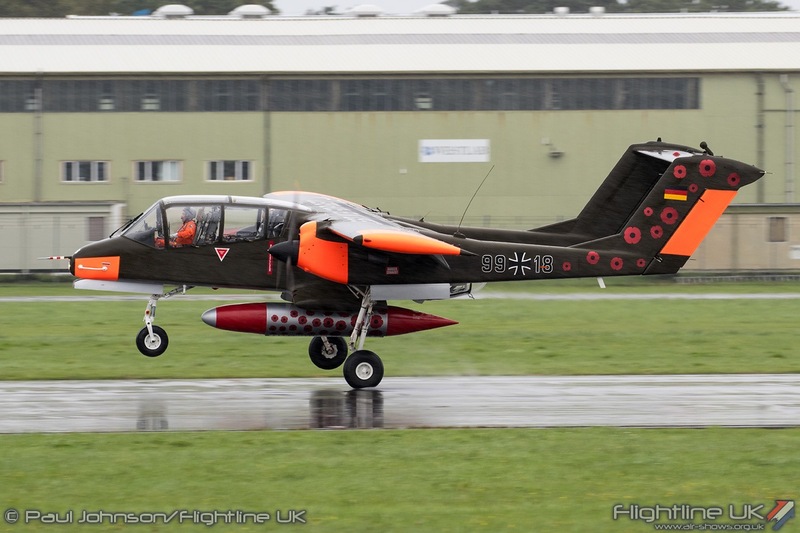 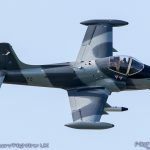 A brand new display for Dunsfold this year was the North American OV-10B Bronco from the Belgian based Bronco Demo Team. 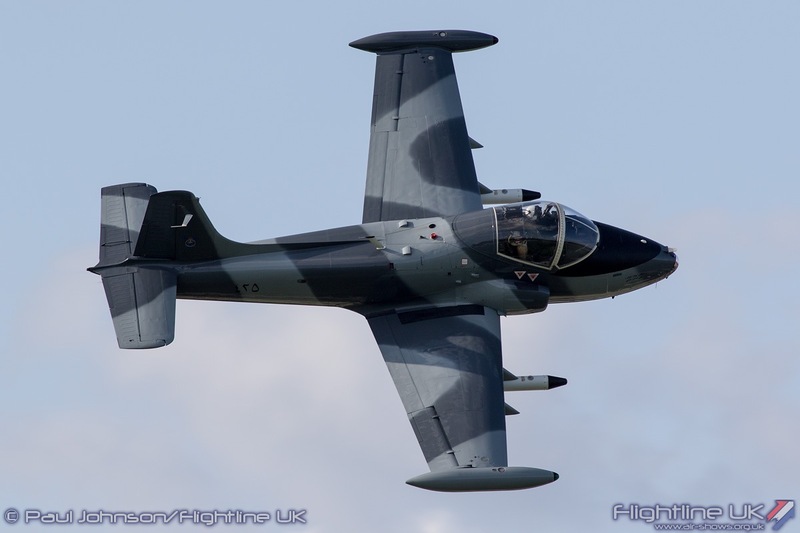 The Bronco was born out of a US requirement for a rugged close air support type during the Vietnam War. 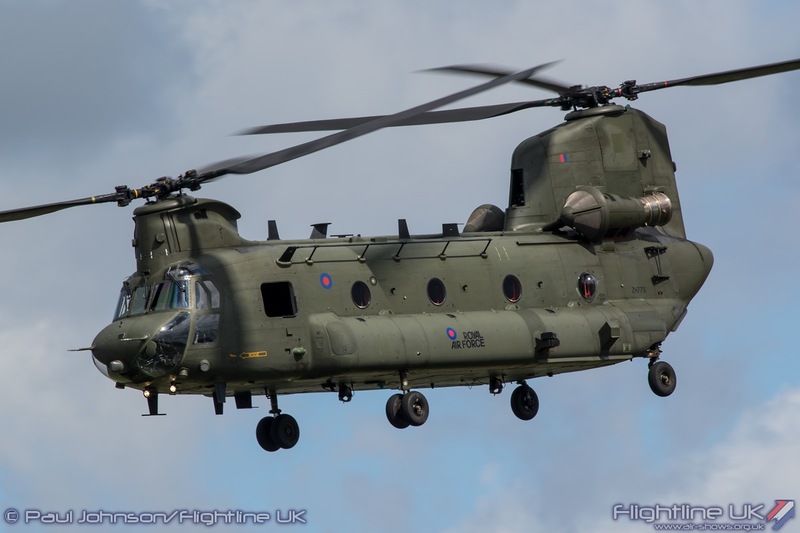 The type subsequently served with the US Air Force, Navy and Marine Corps and saw service through to the 1991 Gulf War. 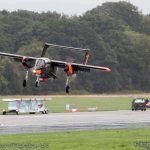 Dunsfold’s display airspace is rather tight as the airfield is close to Gatwick Airport, but thanks to the incredible agility of the OV-10B pilot Tony de Bruyn was able to perform a full show even in Sunday’s poor weather. 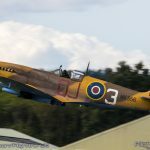 Dunsfold is all about fun, but over the last 14 years it has always marked the history of the airfield and Hawker Aviation. 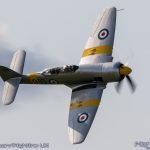 In particular there have been some very memorable tributes to some of the Hawker test pilots that flew from the secretive Surrey airfield. 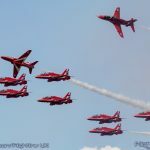 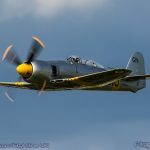 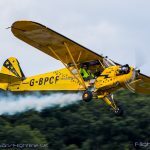 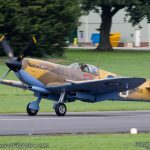 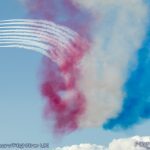 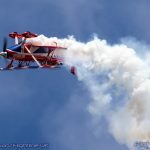 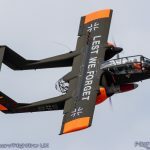 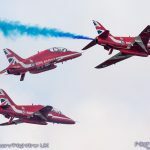 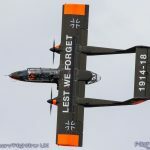 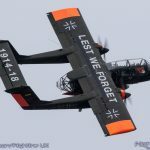 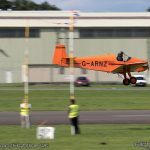 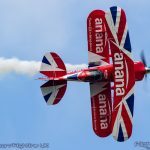 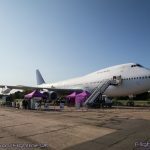 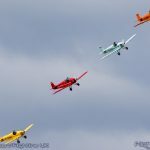 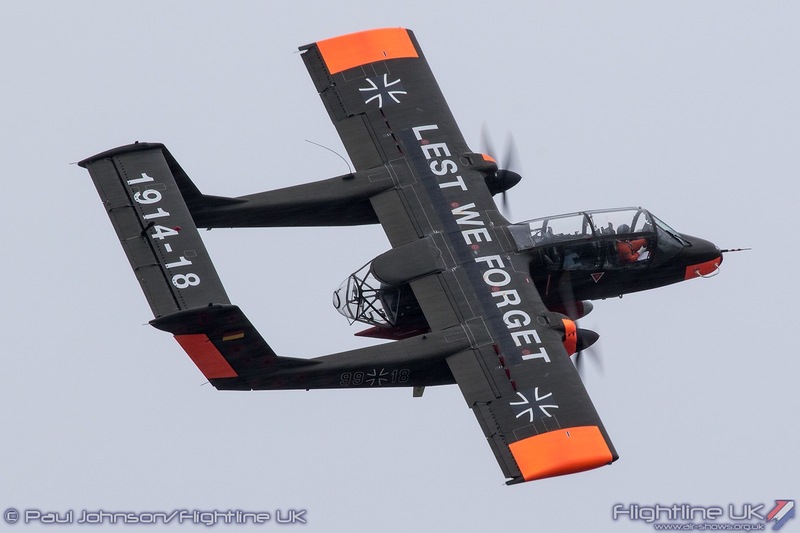 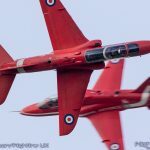 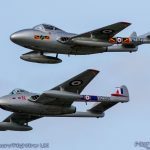 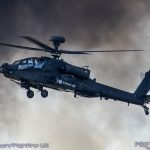 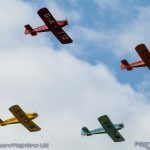 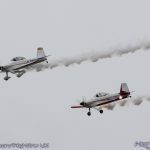 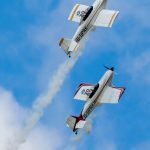 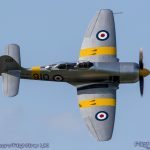 This year saw a unique tribute to two famous Dunsfold test pilots who have recently passed away. 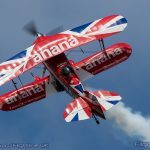 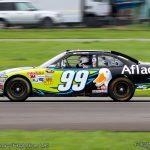 Late last year, Duncan Simpson passed away. 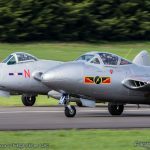 Duncan’s career started as an apprentice at de Havilland Aviation before he joined the Royal Air Force flying the Meteor with 222 Squadron. 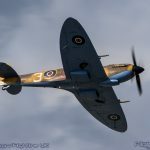 His airmanship was soon recognised and he was posted to the Day Fighter Development Squadron which introduced aircraft like the Supermarine Swift, North American Sabre and Hawker Hunter to RAF service. 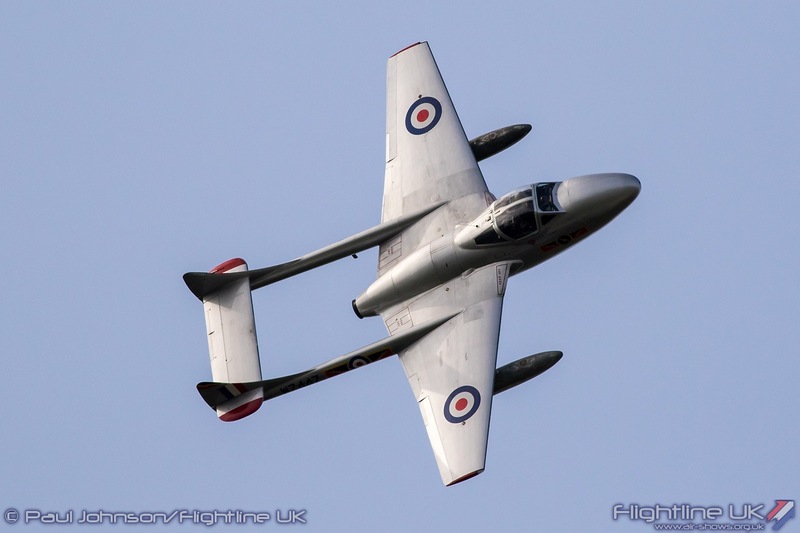 During his time on the squadron, Duncan did much of his testing work on the Hunter and this brought him to the attention of Neville Duke, Hawker’s chief test pilot who asked him to join the company as a test pilot. 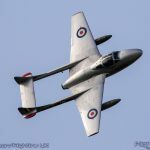 Duncan’s subsequent time at Hawker saw him fly Hunters, become the third pilot to fly the P1127 and train the pilots of the multi-national Kestrel test squadron. 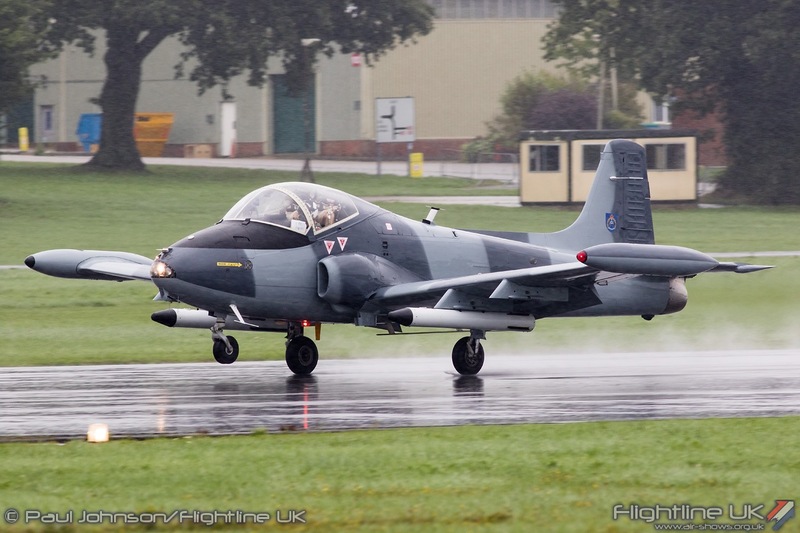 1970 saw Duncan become Hawker’s chief test pilot and he oversaw the development and testing of the Hawk trainer. 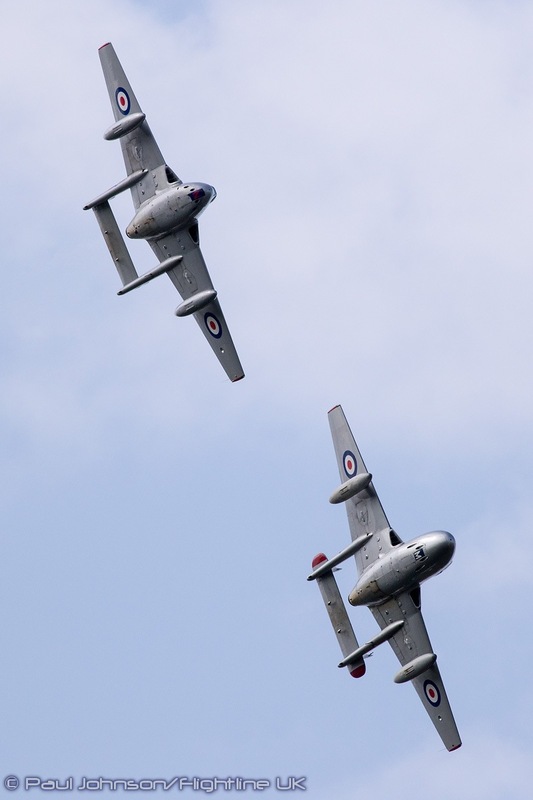 In June we lost John Farley, a test pilot that truly championed the Harrier. 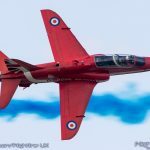 John was born in 1933 and started his aviation career as an apprentice at the Royal Aircraft Establishment before joining the RAF in 1955. 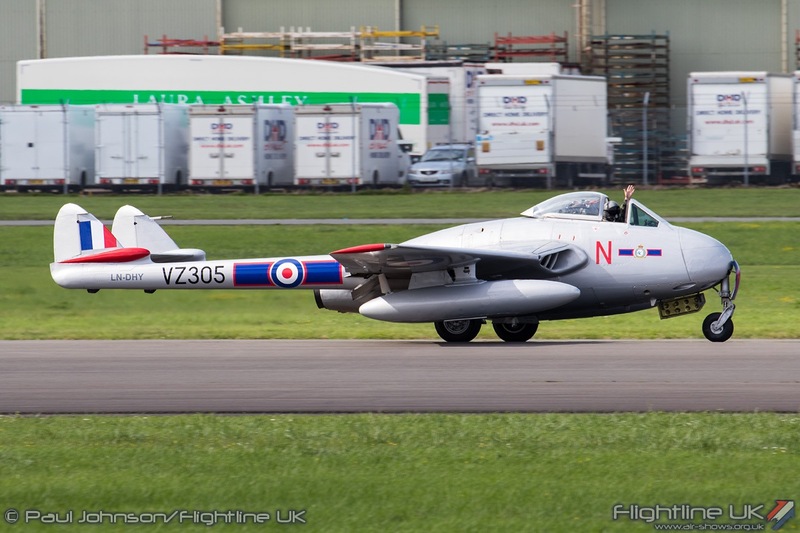 He flew Hunters before becoming a test pilot in 1963 at Bedford. 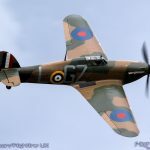 Here he flew some of the most exotic test aircraft including the Fairey Delta and the Handley Page HP115 plus more familiar types such as the Avro Vulcan. 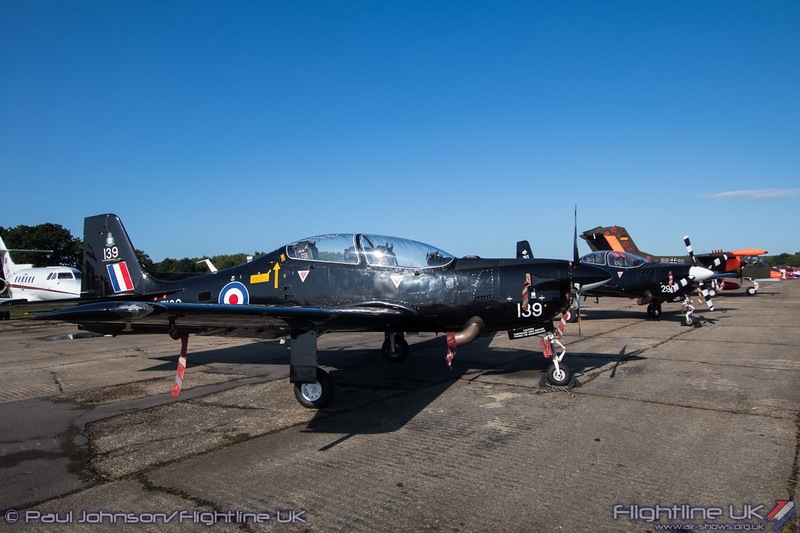 It was at Bedford that John started his long association with the Harrier and by 1978 was Hawker’s chief test pilot at Dunsfold. 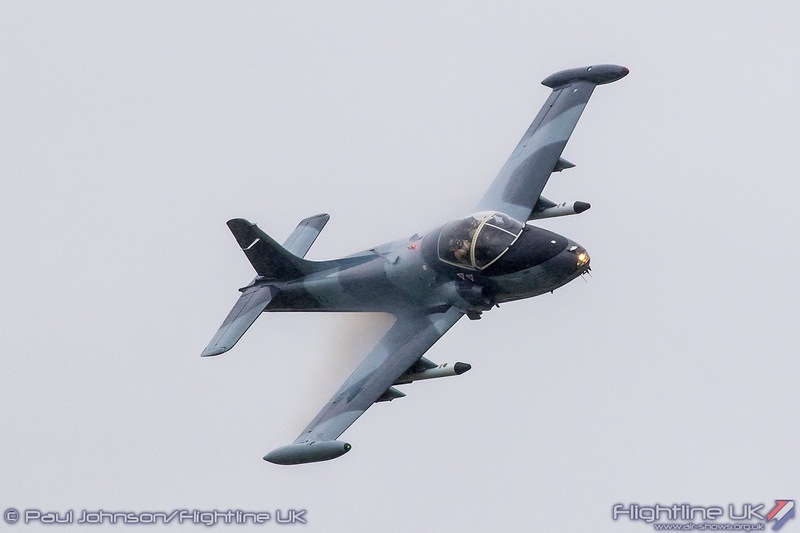 He led the development of the Sea Harrier and the UK side of the Harrier II programme. 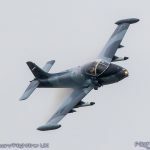 He was perhaps best known for his Harrier displays and invented what became the “Farley Climb” which saw the aircraft climb rapidly from the hover during a display. 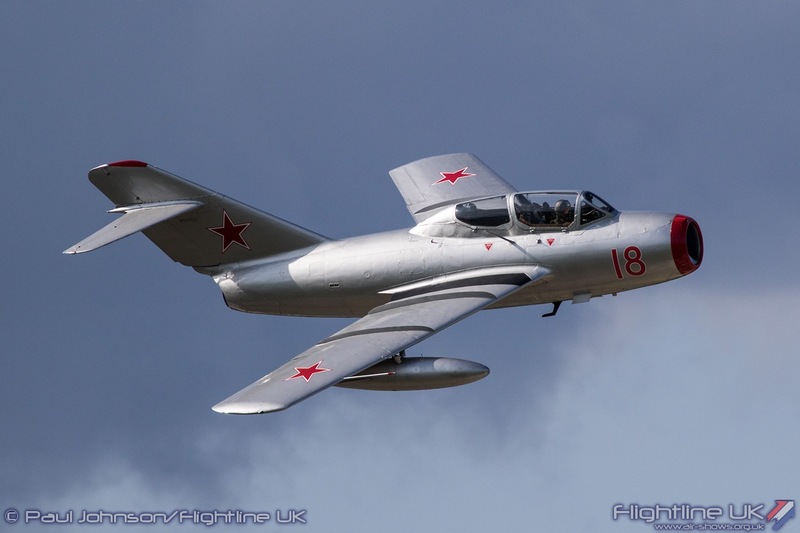 He flew over 100 types including being the first western test pilot to fly the Mikoyan MiG-29. 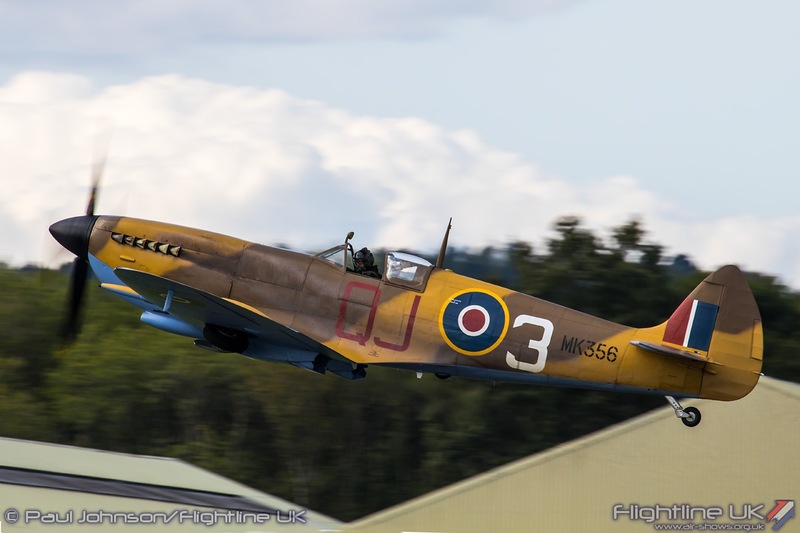 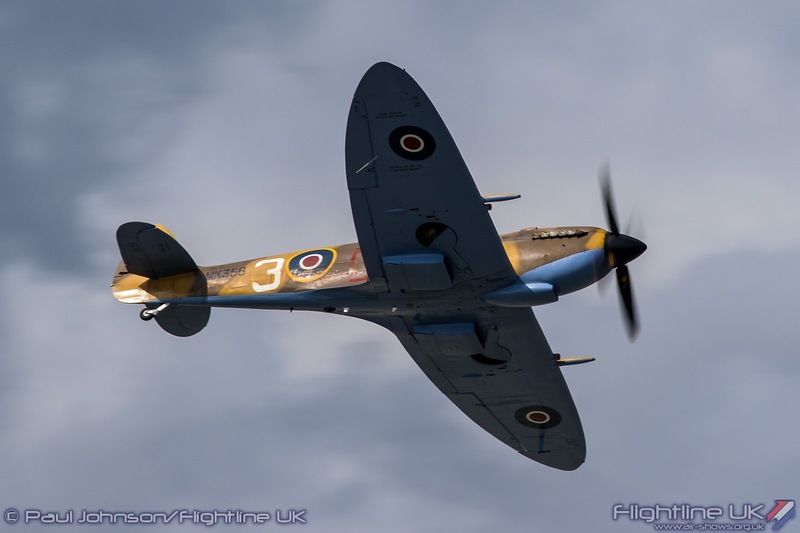 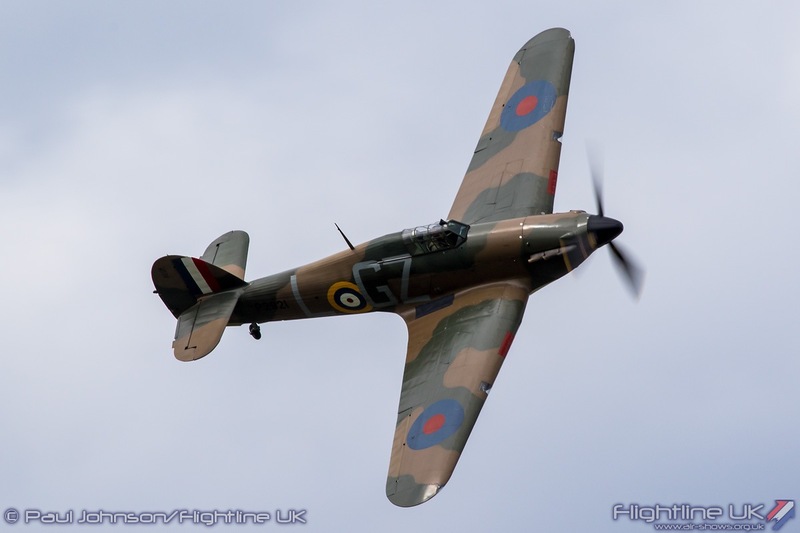 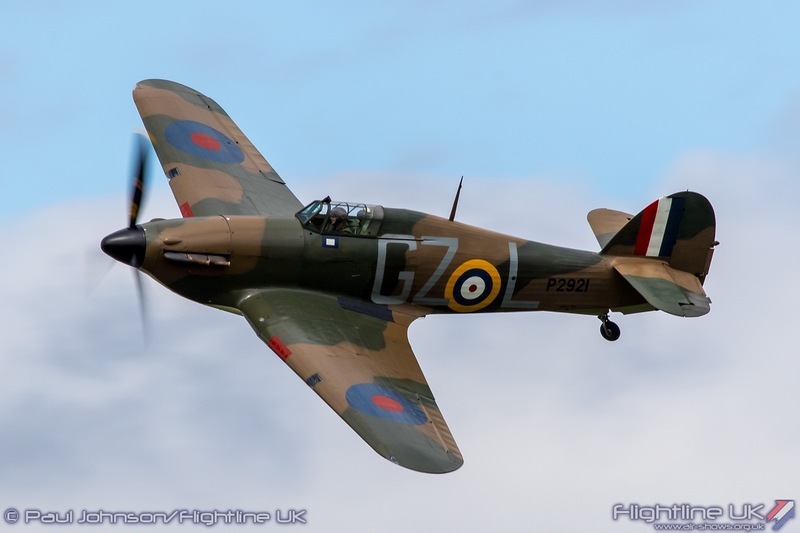 He was also a respected warbird display pilot often flying the Old Flying Machine Company’s Spitfire MH434. 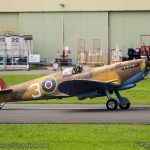 In tribute to Duncan and John, Peter Teichman flew a smooth aerobatic sequence in the Biggin Hill Heritage Hangar’s Hawker Hurricane X. 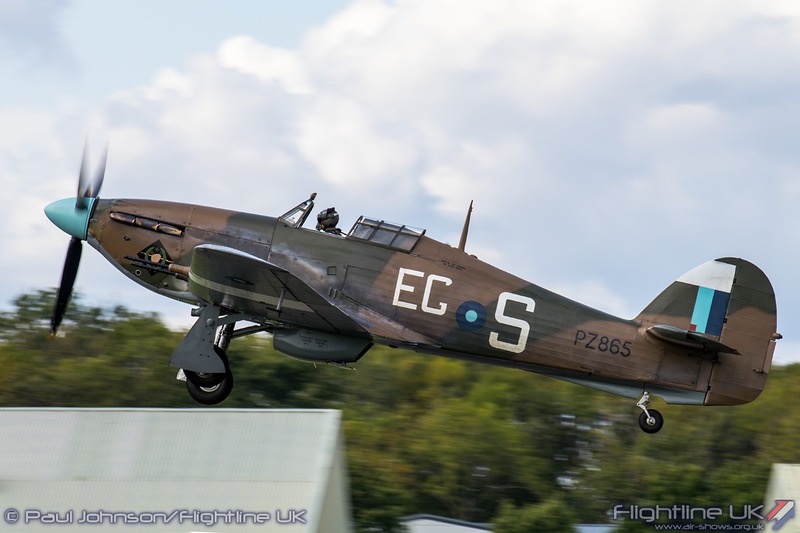 The Hurricane is a type closely associated with the Harrier test programme at Dunsfold as Hurricane IIc PZ865 was used as a slow speed chase aircraft. 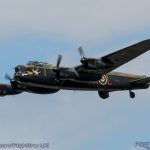 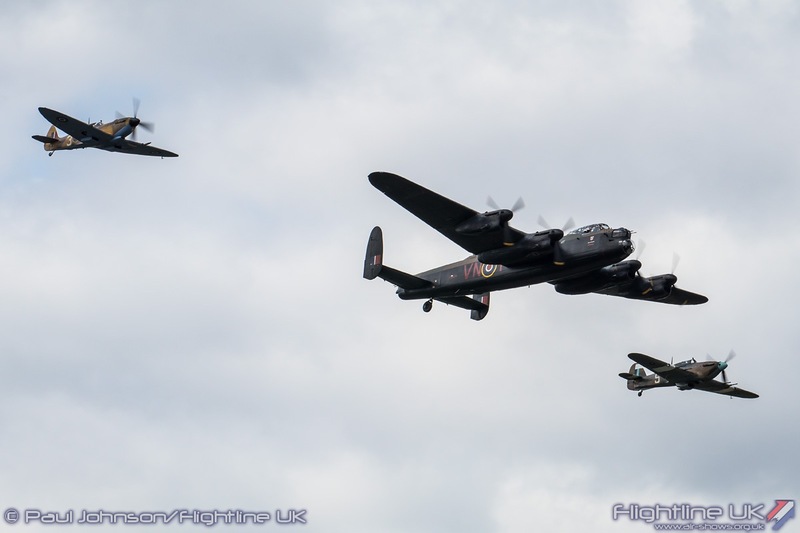 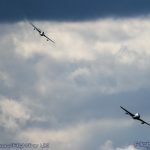 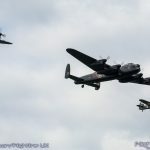 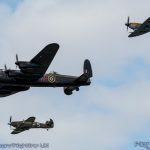 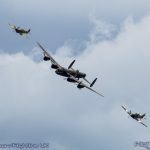 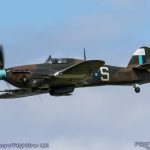 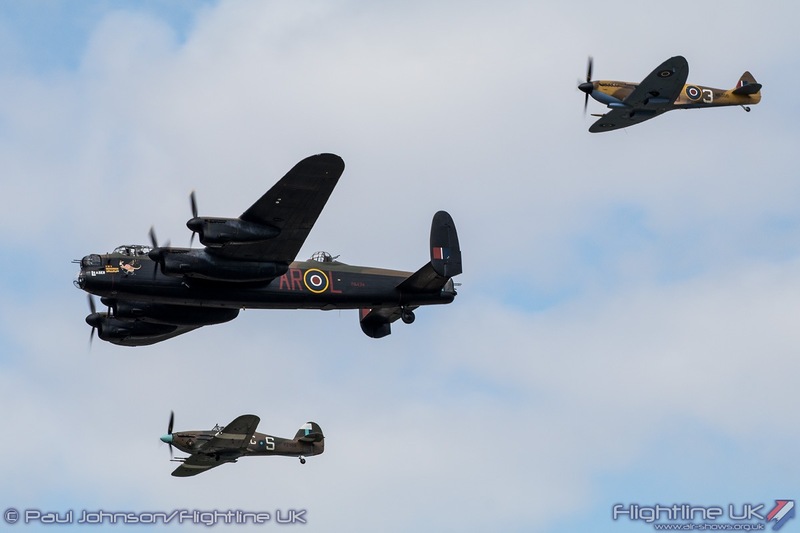 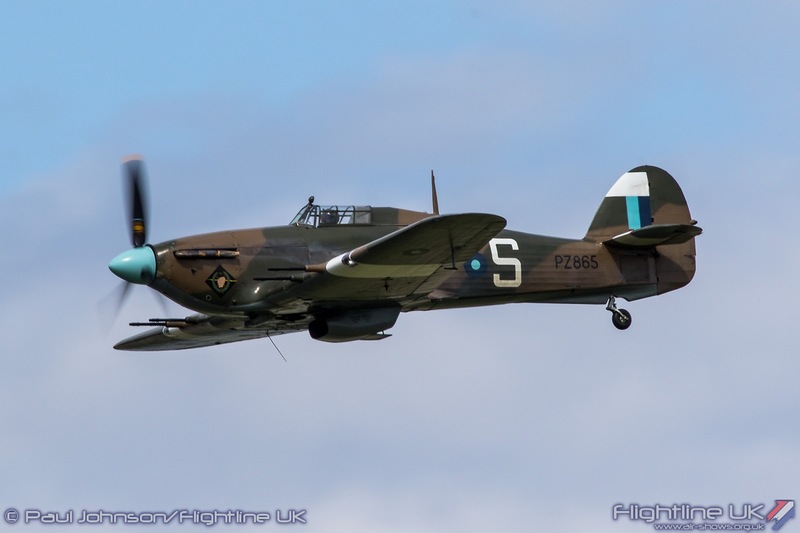 By coincidence, a change from the planned make-up of the Battle of Britain Memorial Flight’s participation at Wings and Wheels meant the ‘PZ’ was also at the show alongside the Avro Lancaster B1 PA474 and Supermarine Spitfire IX MK356. 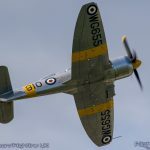 The Spitfire’s current colour scheme was also a further connection to Dunsfold as it represents a Spitfire flown by Neville Duke who also was a famous Hawker test pilot and lived in the small Cottage at the Compass entrance to the airfield. 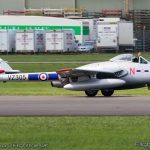 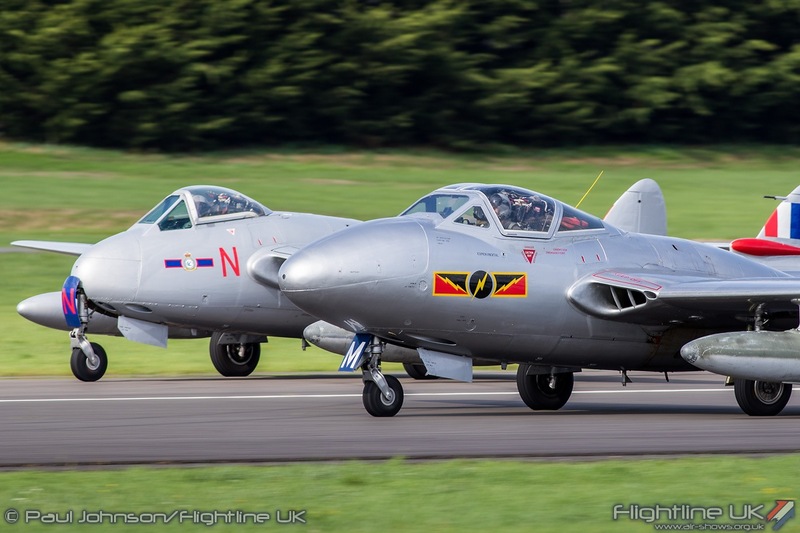 The Norwegian Air Force Historical Squadron had their complete fleet at Dunsfold with their Mikoyan-Gurevich MiG-15UTi joined by the de Havilland Vampire FB52 and T55. 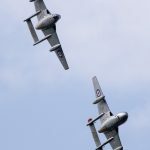 Rolf Meum led the pair of Vampires which performed a graceful routine of formation flying before an aerobatic tailchase. 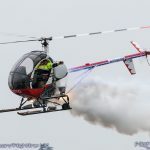 Kenneth Aarkvisla flew a solo routine in the MiG ending his display with some strafing and bombing runs supported by some impressive pyrotechnics. 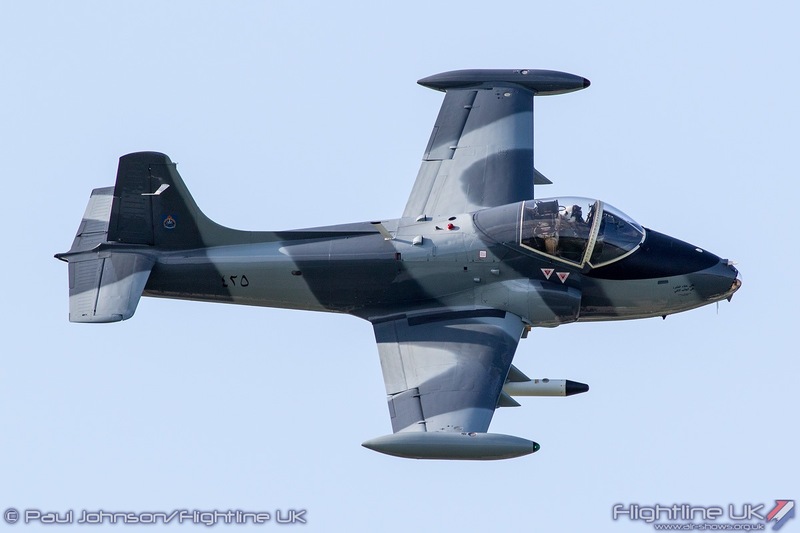 Adding to the impressive collection of classic jets was the BAC Strikemaster Mk82a ably flown by Mark Petrie who flew an eye-catching aerobatic routine. 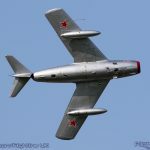 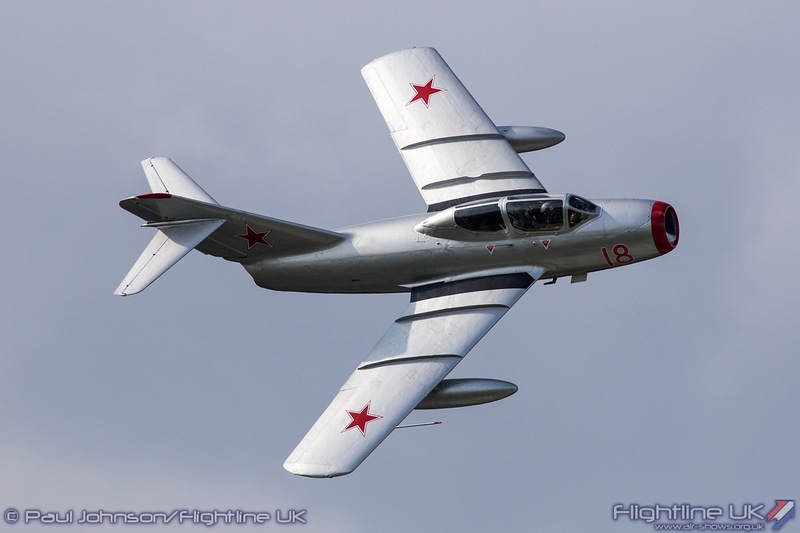 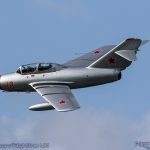 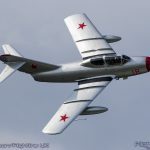 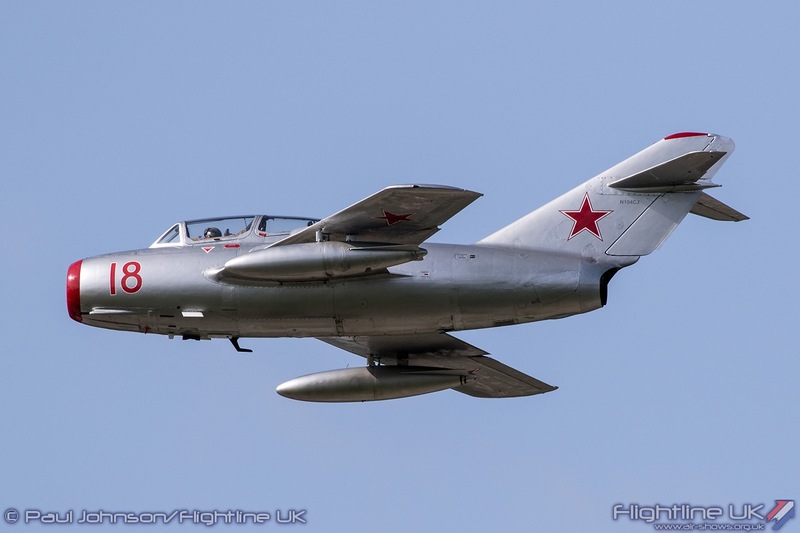 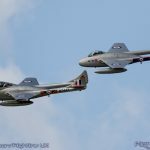 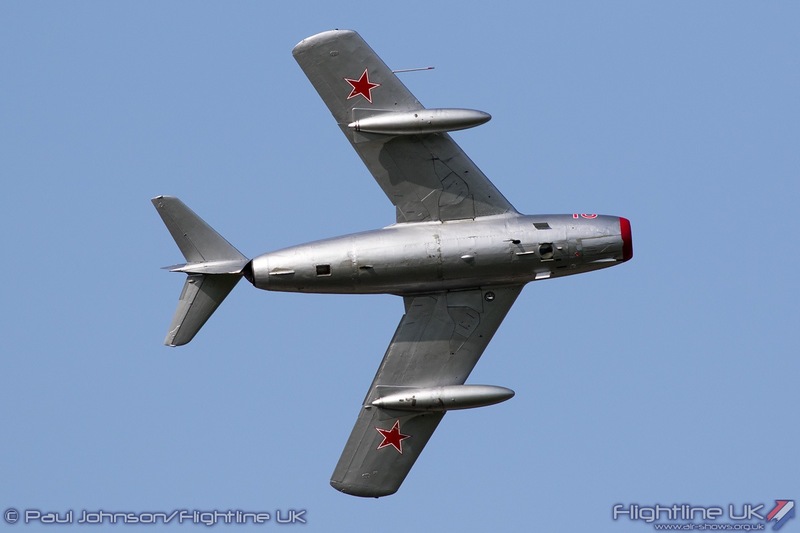 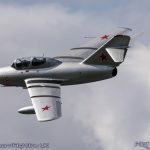 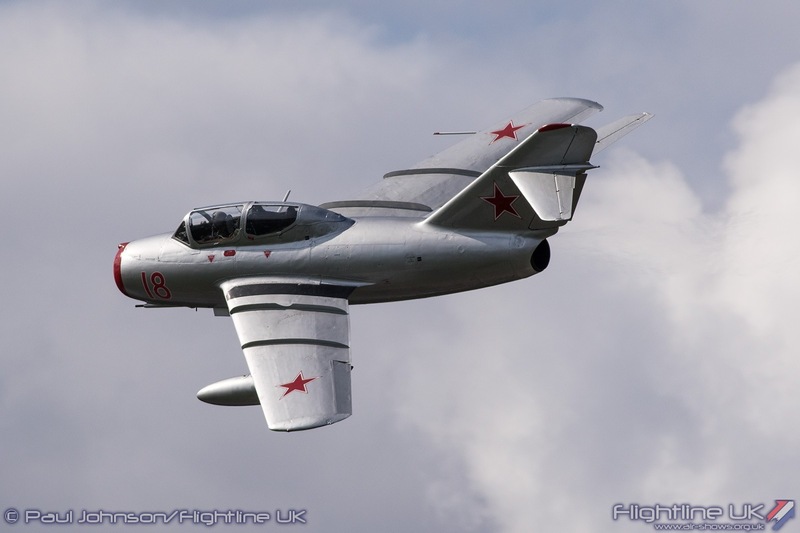 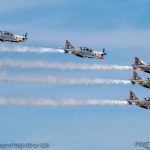 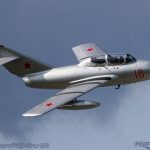 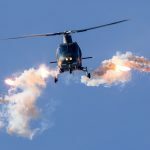 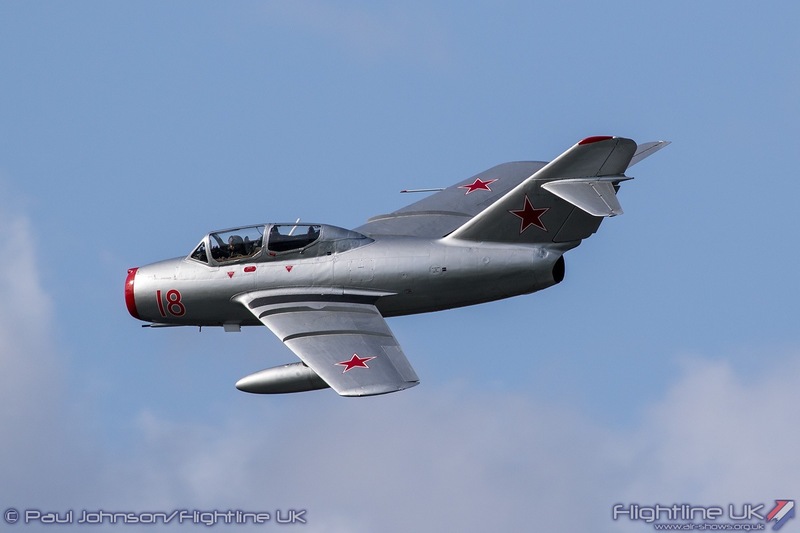 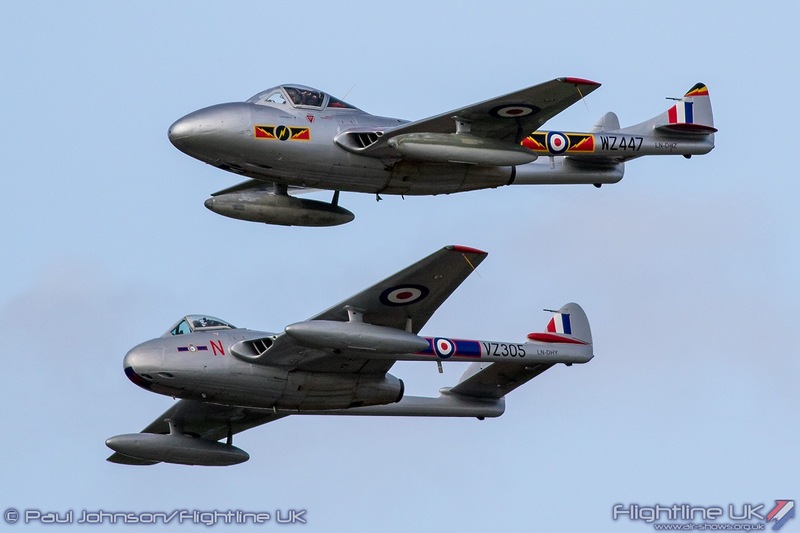 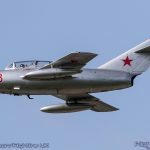 The pyrotechnics mentioned earlier were planned for a joint formation and dogfight sequence between the MiG-15 and the Royal Navy Historic Flight’s Sea Fury T20. 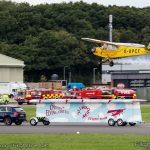 Sadly the RNHF aircraft became unavailable at the last minute. 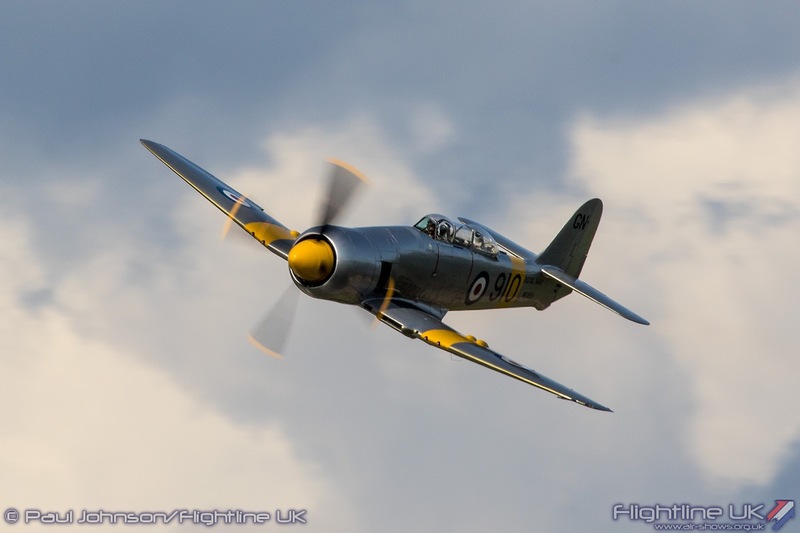 It was replaced in the display by Norwegian Spitfire Foundation’s Hawker Sea Fury T20 G-INVN flown by Brian Smith. 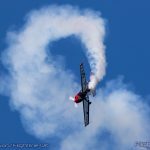 Brian flew a really eye-catching solo routine in the tight display area in the powerful fighter which has recently been named “Invincable” by the NSF. 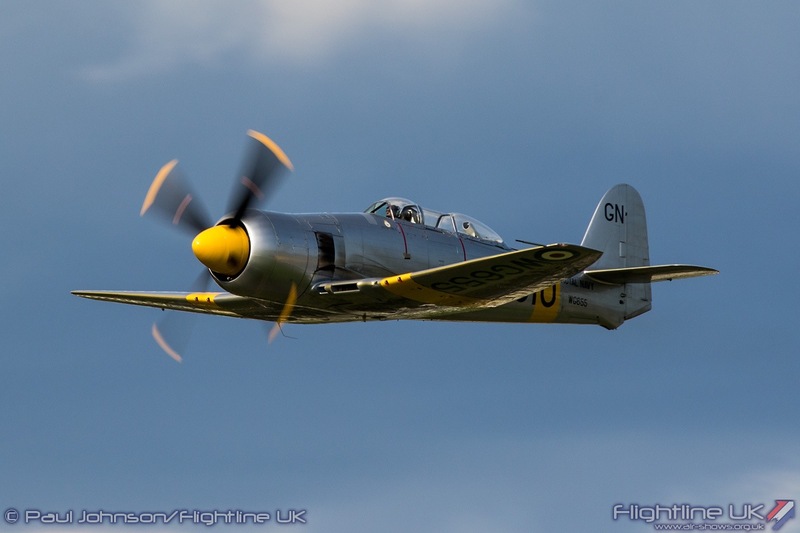 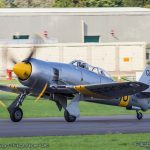 The display was also notable as it marked the first time the Sea Fury had displayed under the custodianship of the Norwegian organisation. 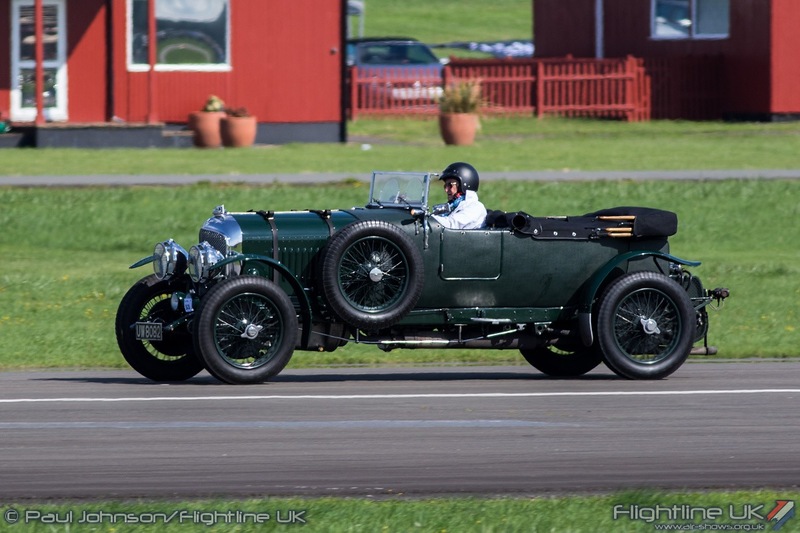 Further historic flying came from a number of Dunsfold favourites. 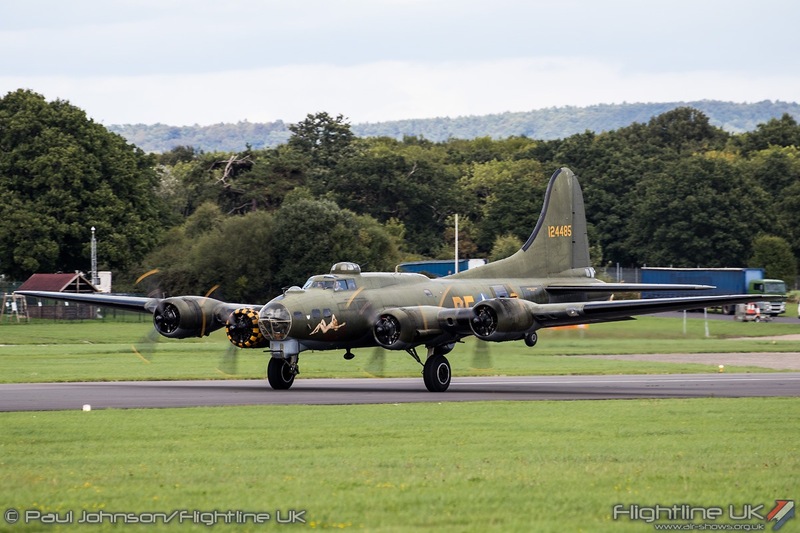 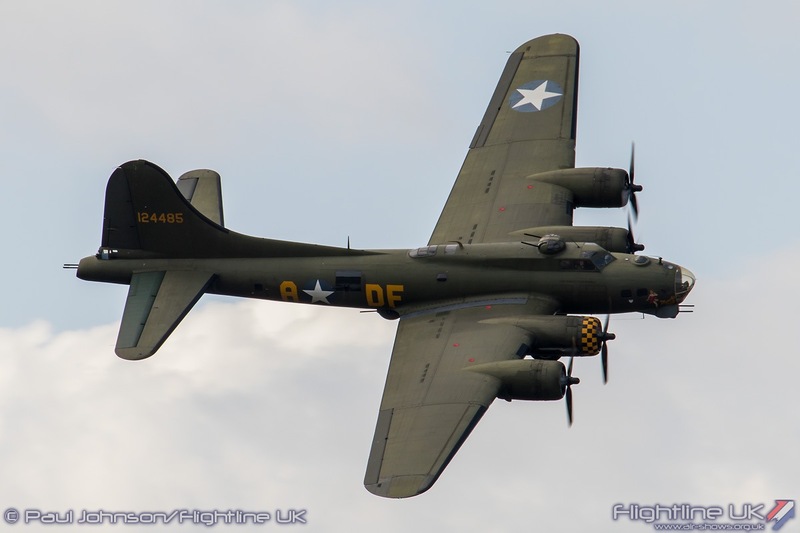 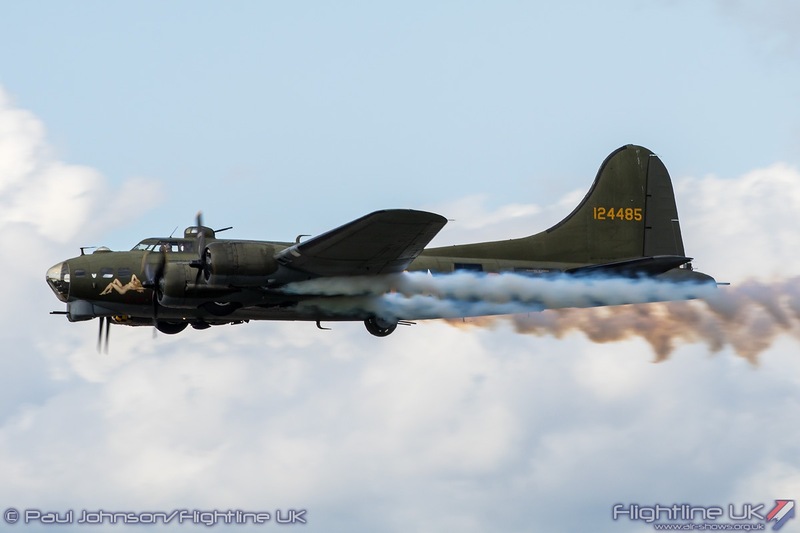 Boeing B-17G Flying Fortress Sally-B made a welcome return marking the contribution of the United States Army Air Force to the European air war between 1942 and 1945. 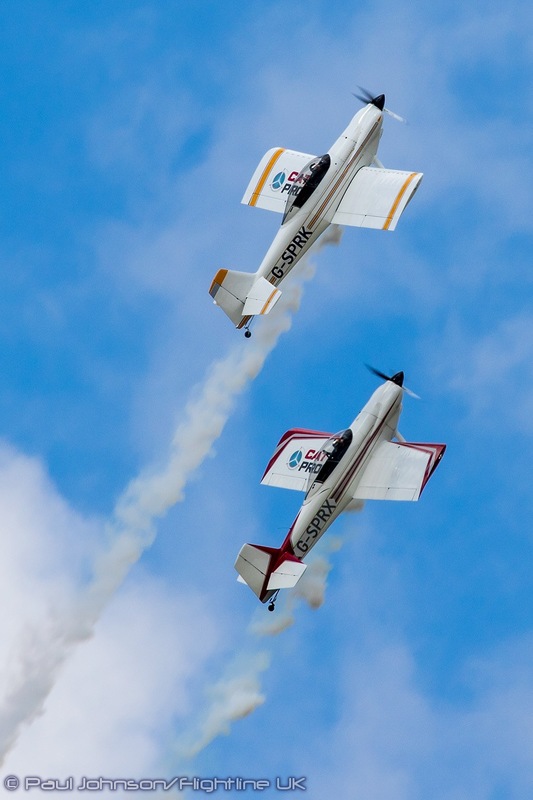 In between the military displays were some sharp formation aerobatics from a pair of civilian teams. 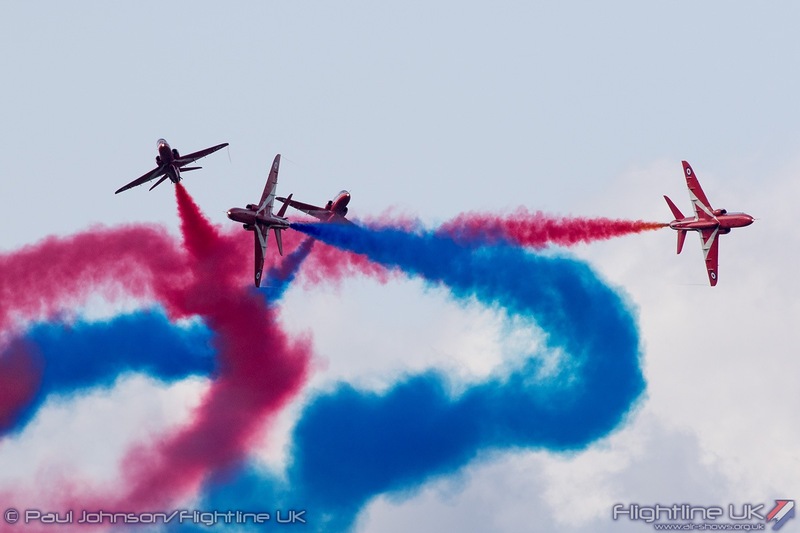 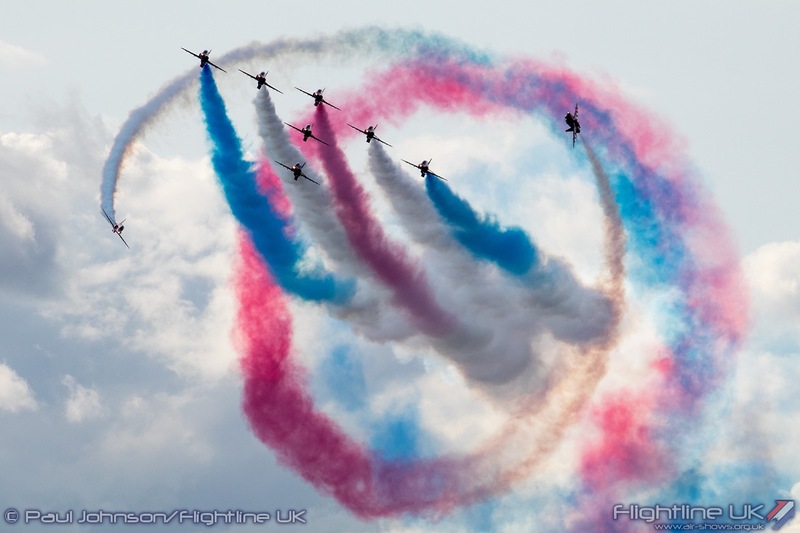 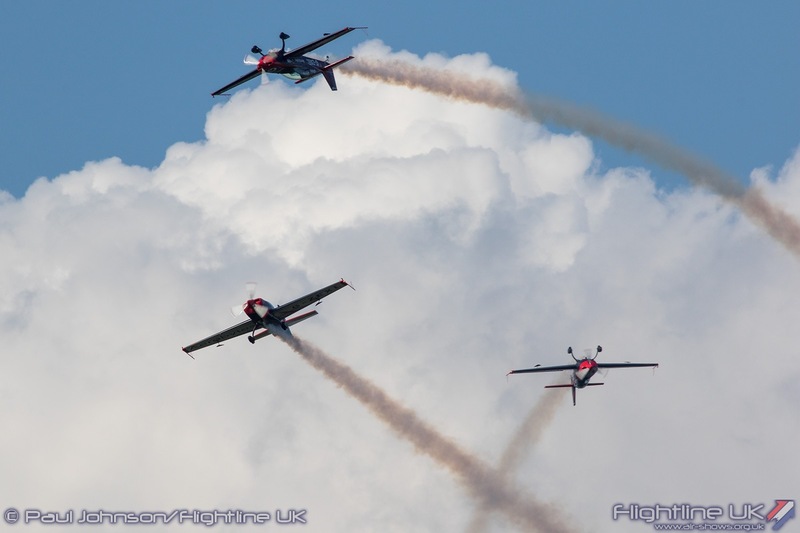 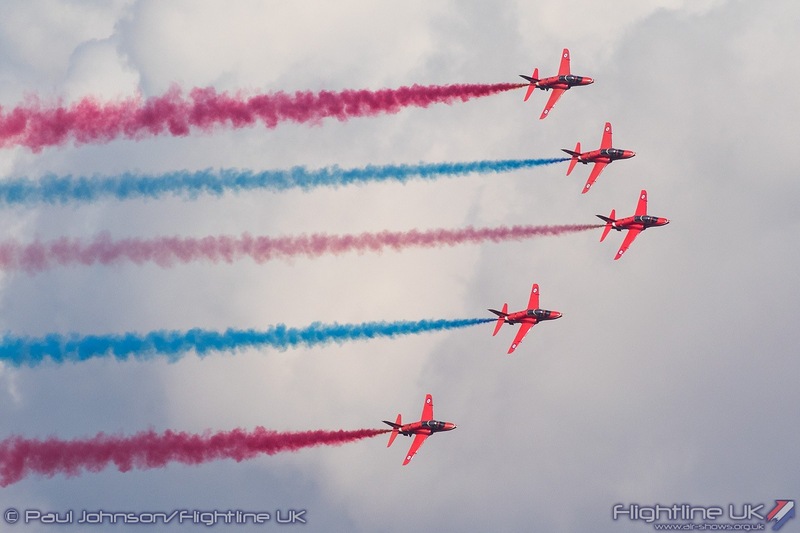 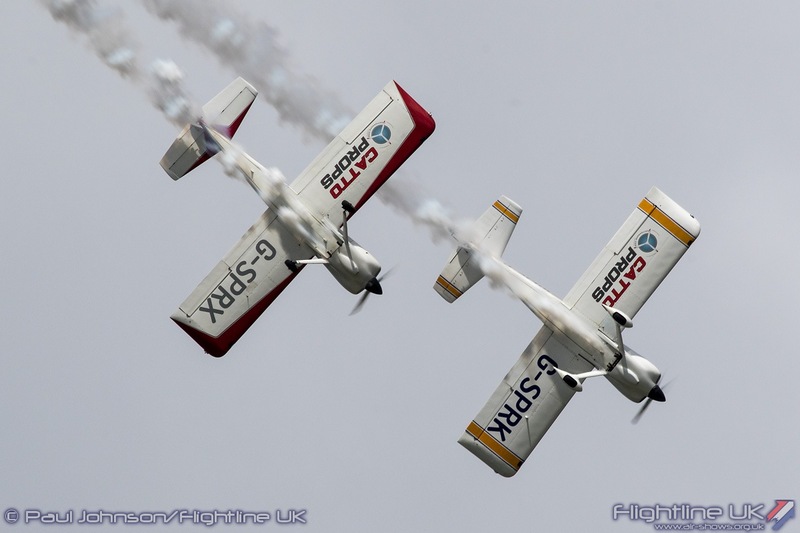 The Blades Aerobatic Team have been regulars at Wings and Wheels over the years. 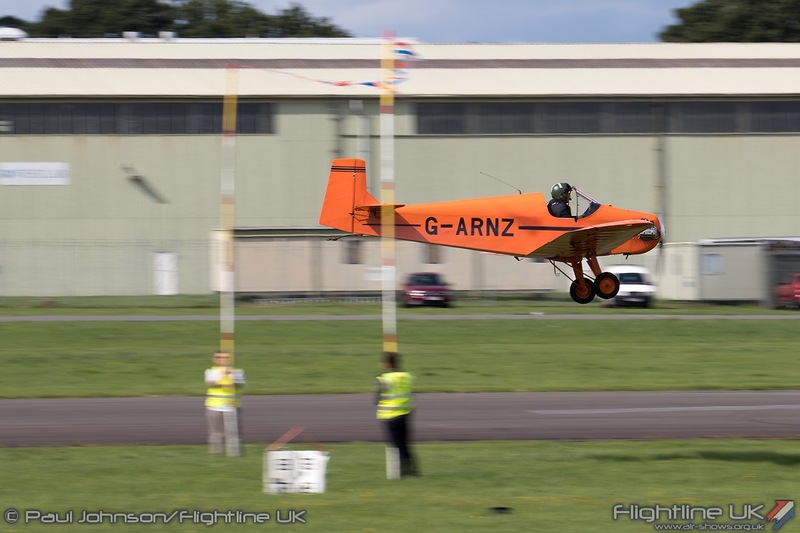 They are supported by Aerobytes whose owner lives locally to the airfield. 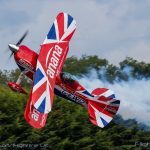 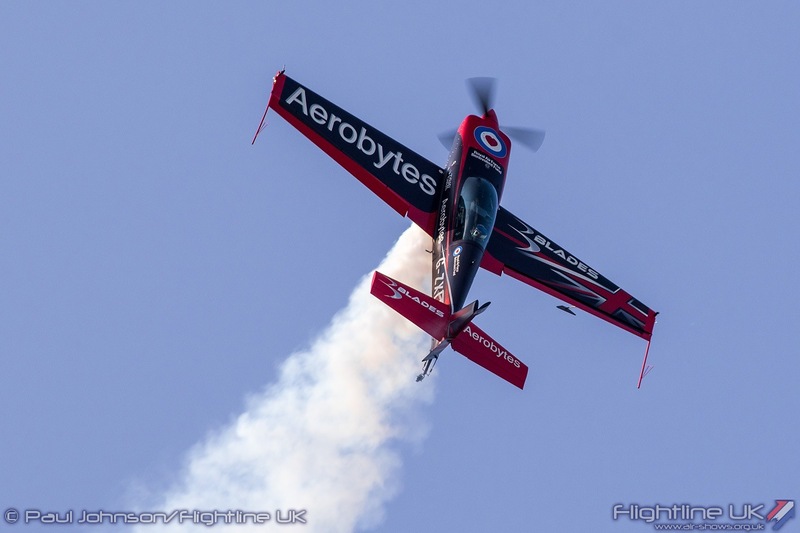 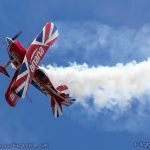 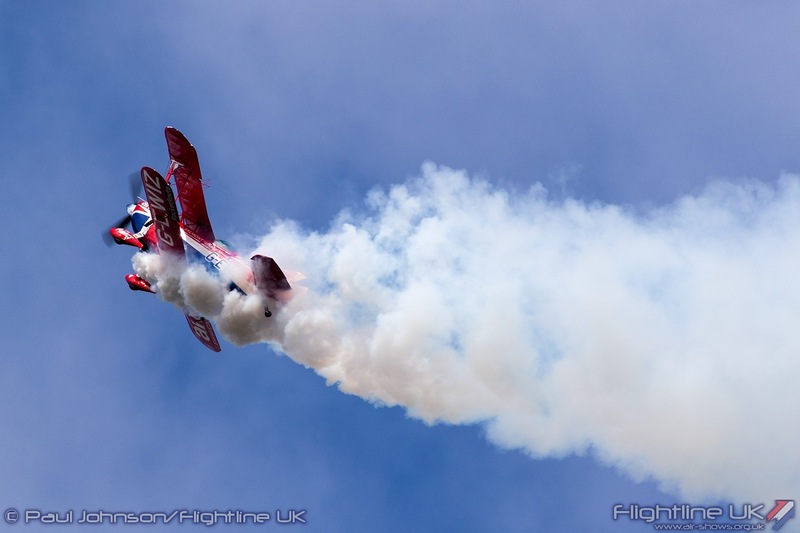 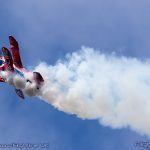 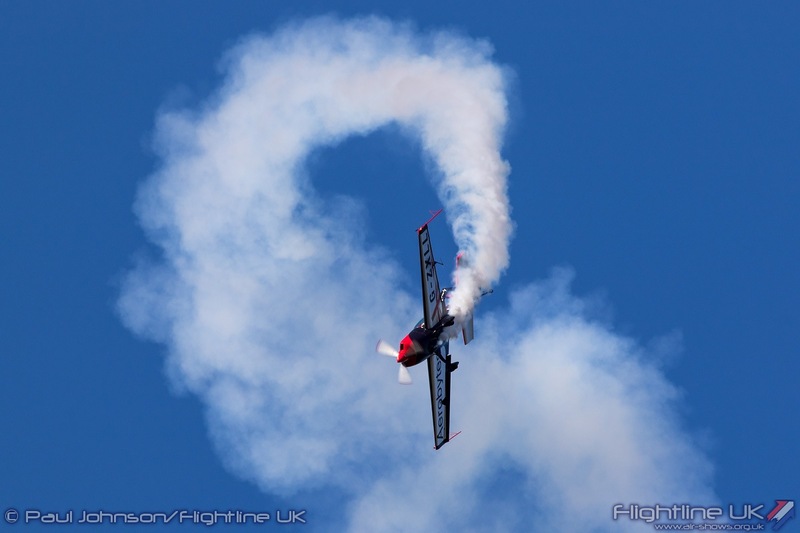 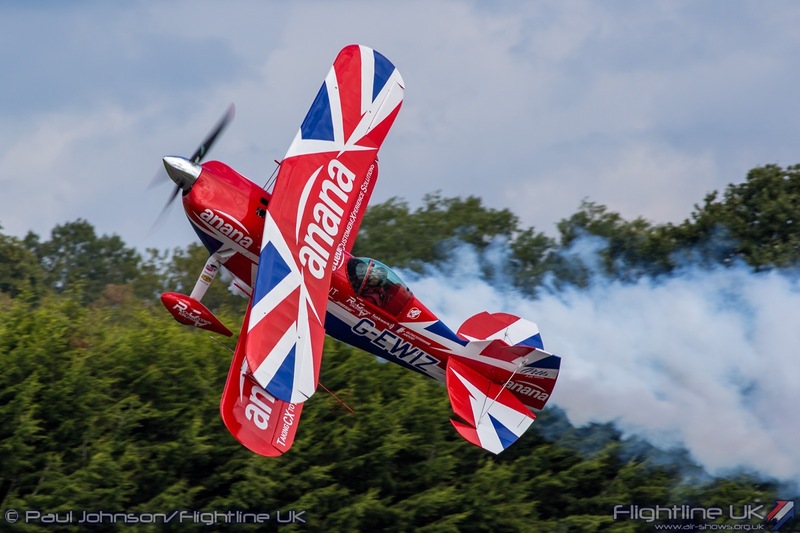 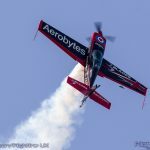 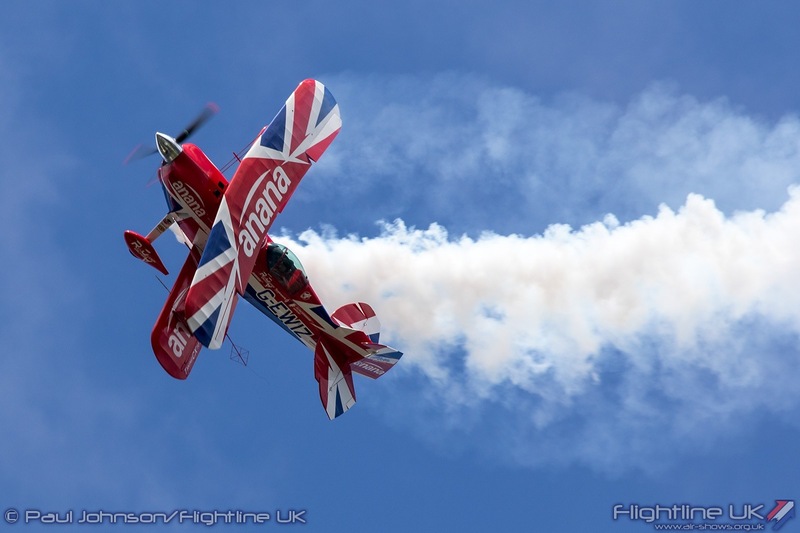 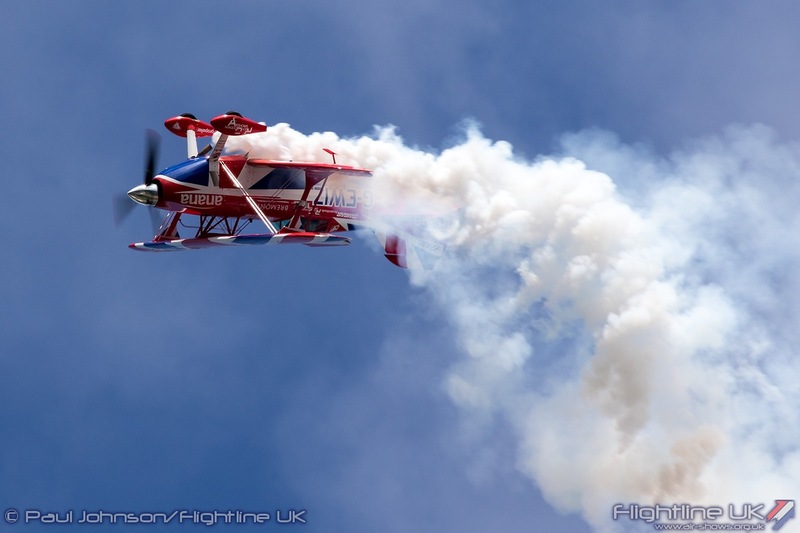 For 2018 the team have been joined by UK Unlimited Aerobatic Champion Gerald Cooper who adds some added spice to the solo segments of the display. 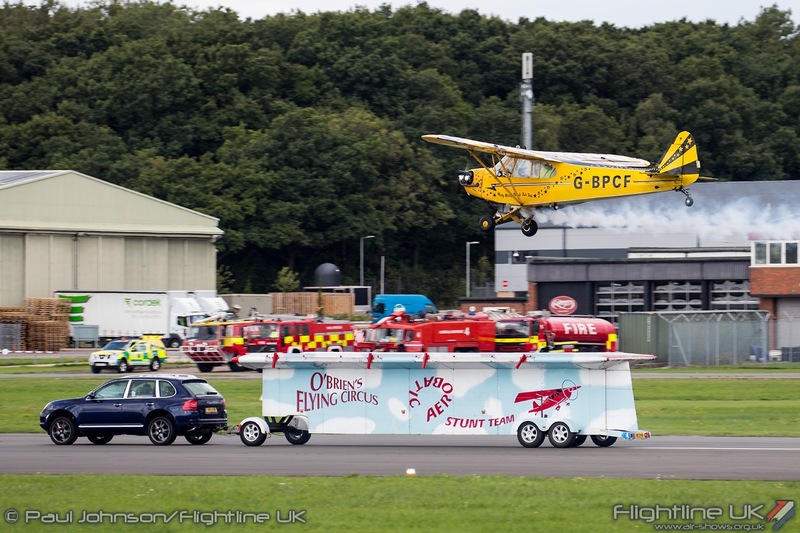 The Fireflies Aerobatic Team were another display making their Dunsfold debut. 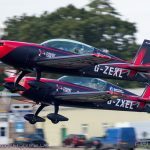 The team are relative locals to Dunsfold as pilots Jon Gowdy and Andy Durston both live in West Sussex and base their aircraft on a nearby private strip. 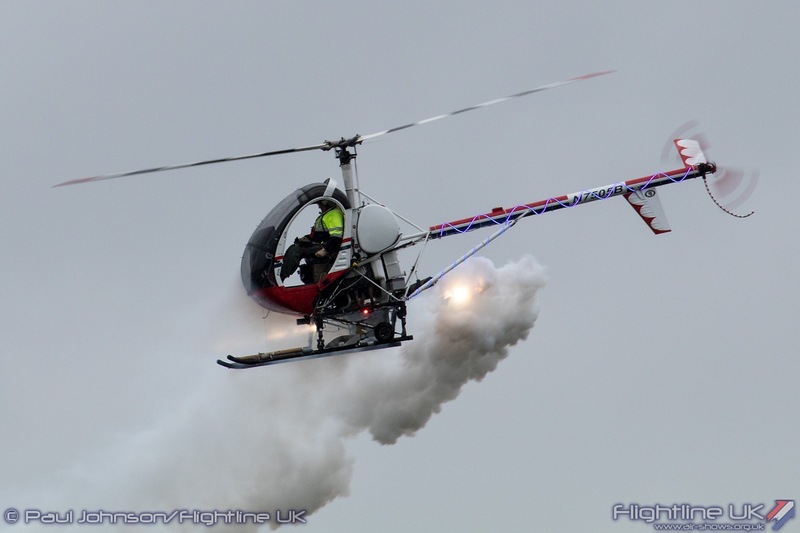 The team have performed both daytime and evening pyrotechnic displays across the UK and Europe over the last few years in their Vans RV4s. 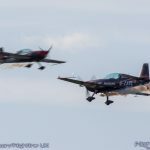 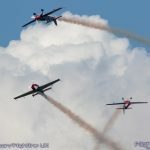 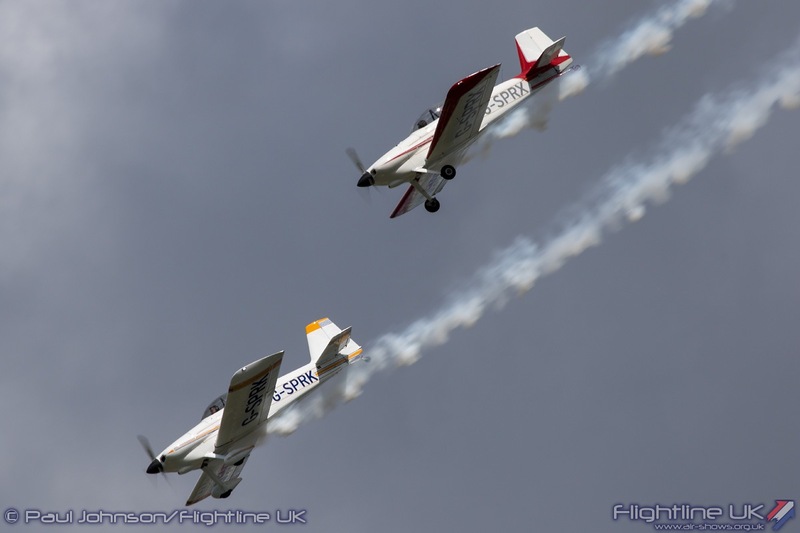 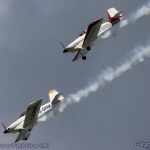 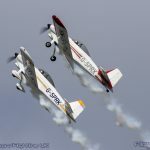 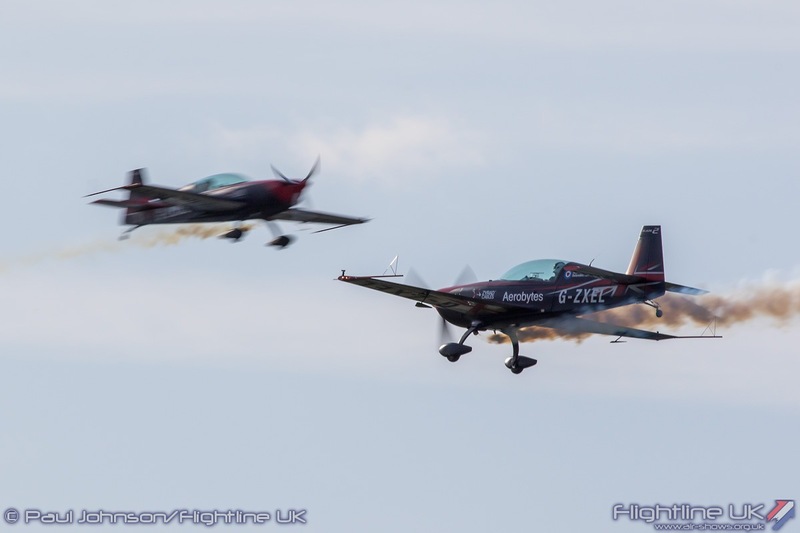 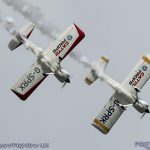 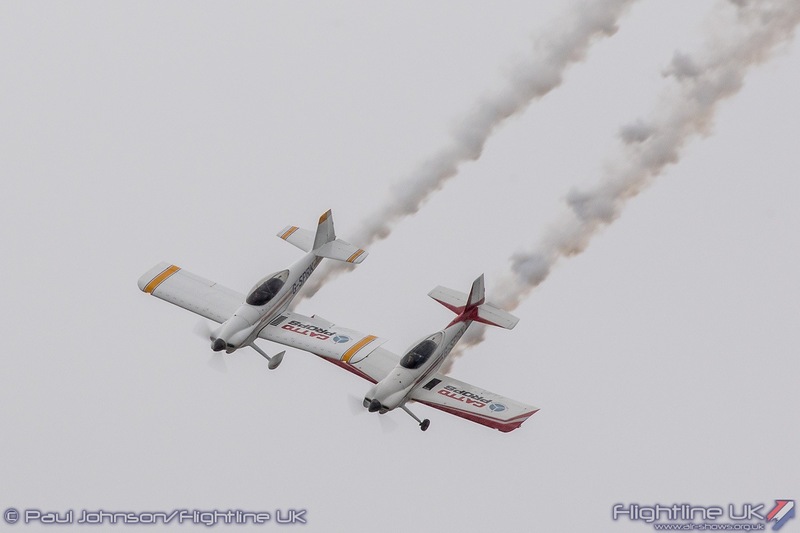 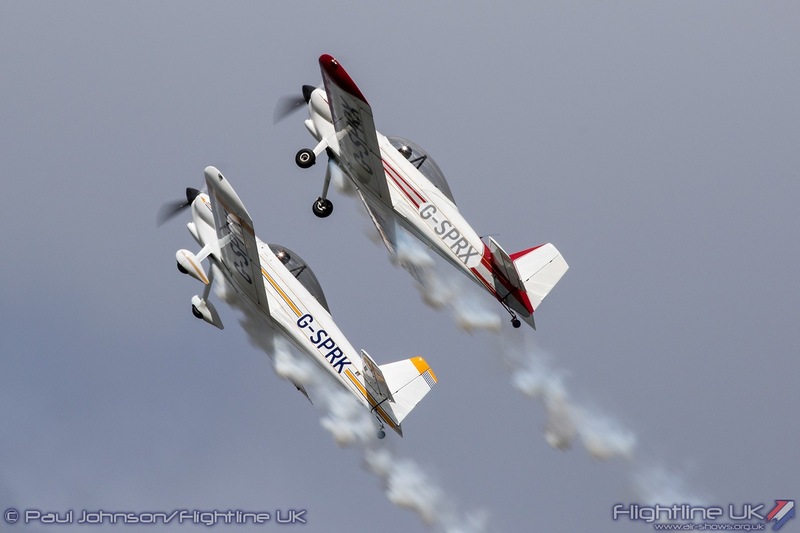 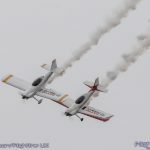 Their daytime show which they flew at Dunsfold is a mix of close formation and synchronised aerobatics highlighting the speed and manoeuvrability of the popular RV4. 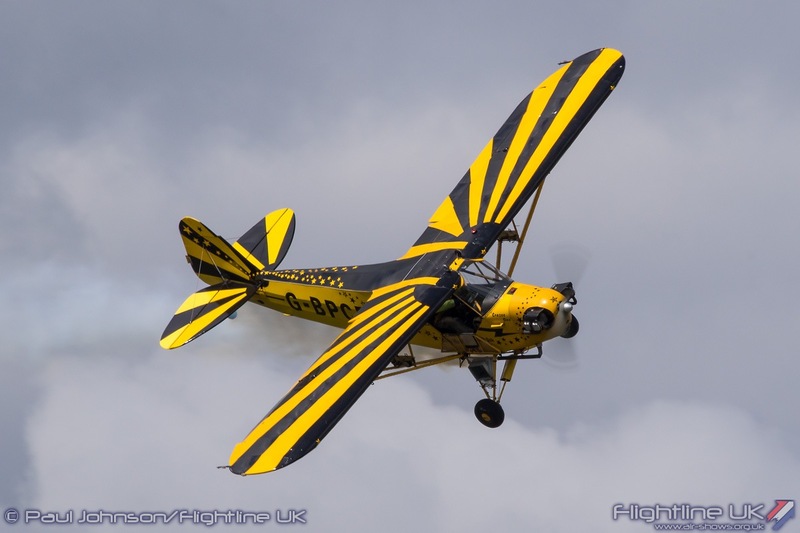 Adding to the Flying Circus theme which opened the show with Brendan O’Brien were the Tiger Club’s Turbulent Display Team. 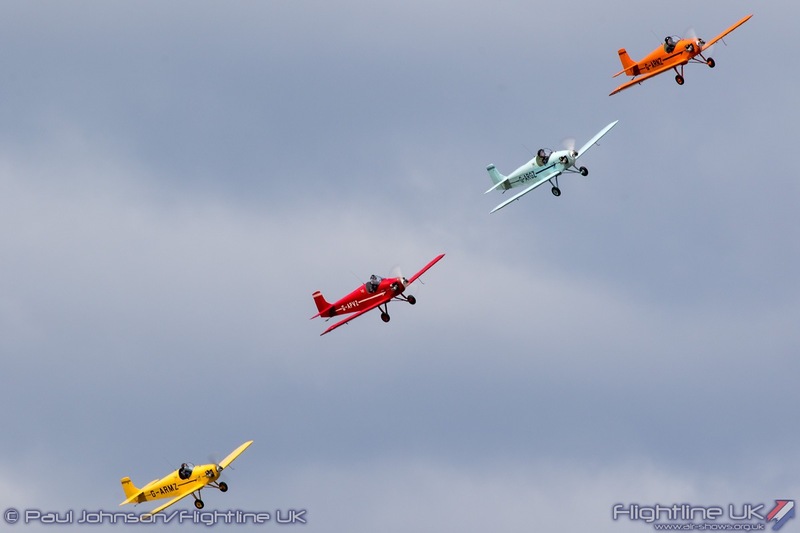 The Tiger Club promotes flying for fun and this team have been the ultimate exponent of that for nearly 60 years. 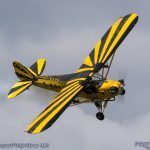 Flying four very colourful Druine D31 Turbulents, the team performed all the classics of flying circus including balloon bursting, flour bombing and limbo flying. 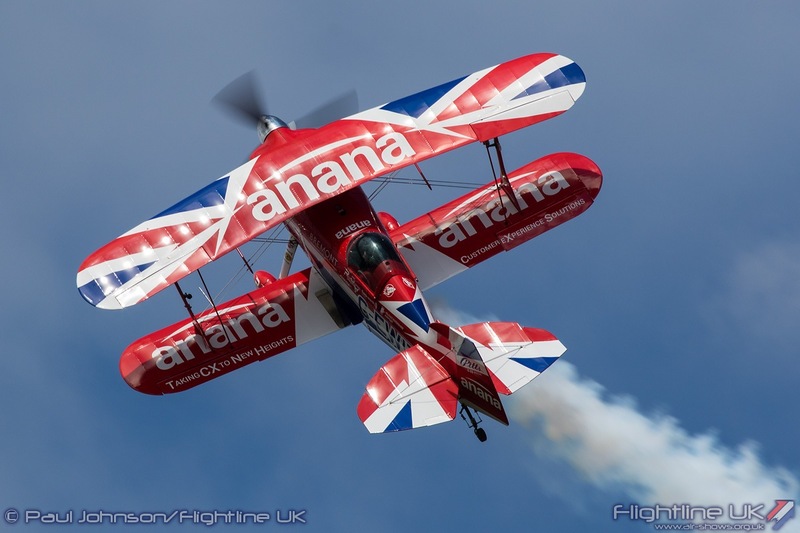 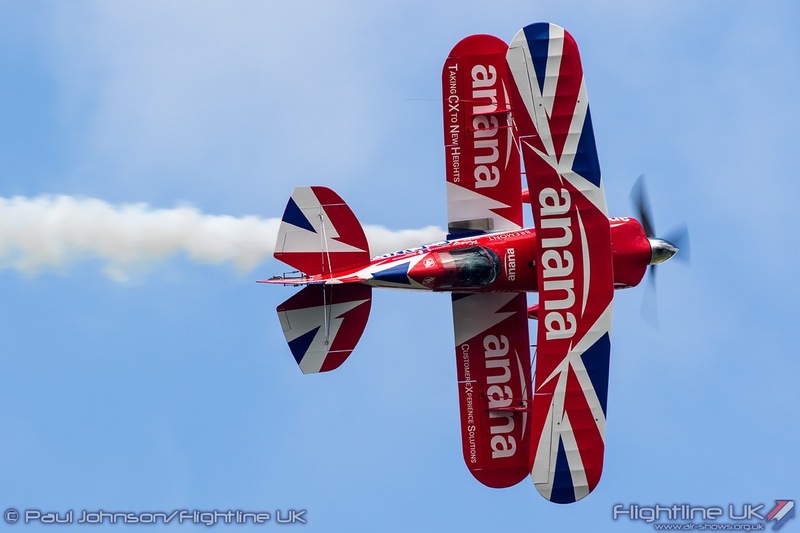 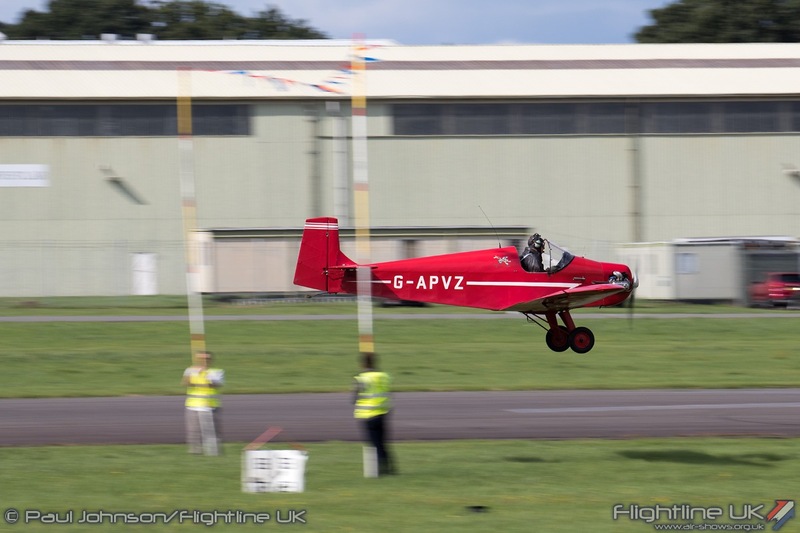 Solo aerobatics came from Rich Goodwin flying his incredible Pitts S-2S Special G-EWIZ. 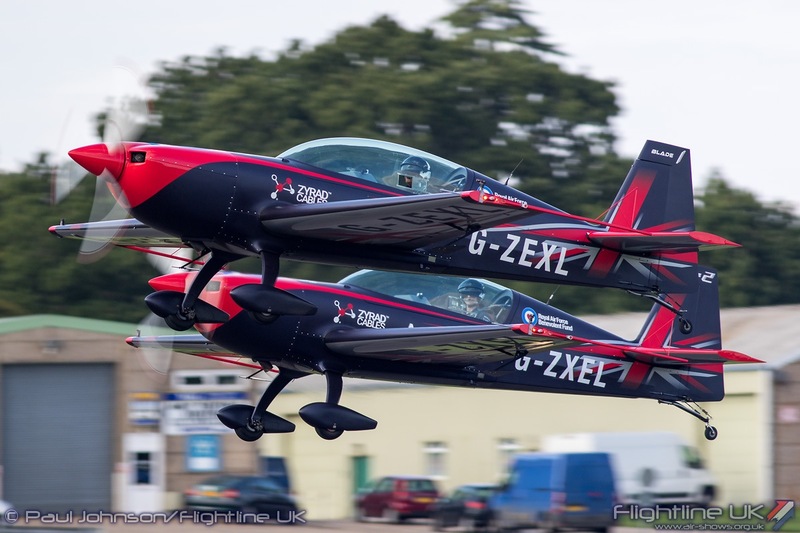 ‘IZ has been heavily modified by Rich with new wings and tailplane making the aircraft lighter and capable of even more extreme aerobatics. 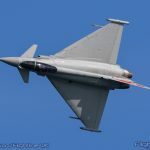 The modern military contribution to the flying display was slightly smaller than usual with notably the Typhoon displaying in Poland for their air forces centenary. 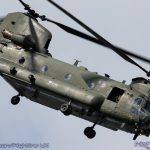 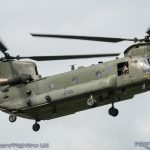 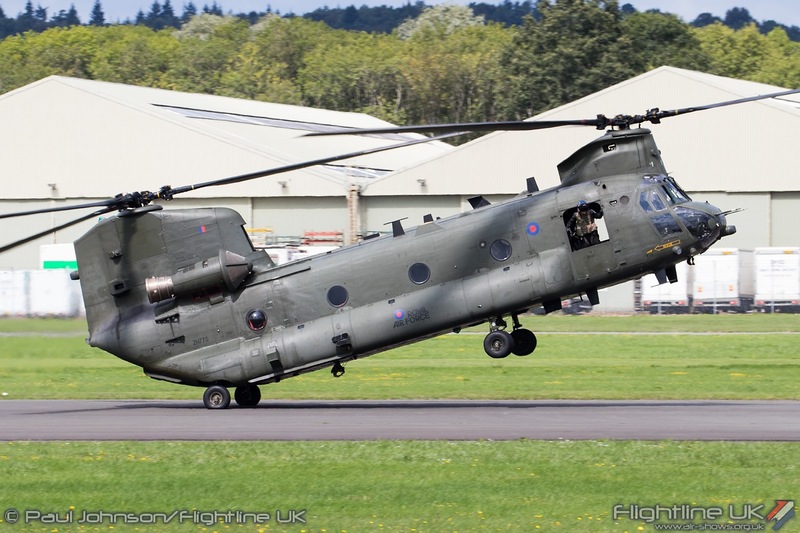 Dunsfold did however manage to attract the Boeing Chinook HC6A display for both days of the show. 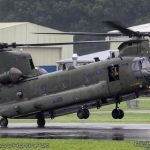 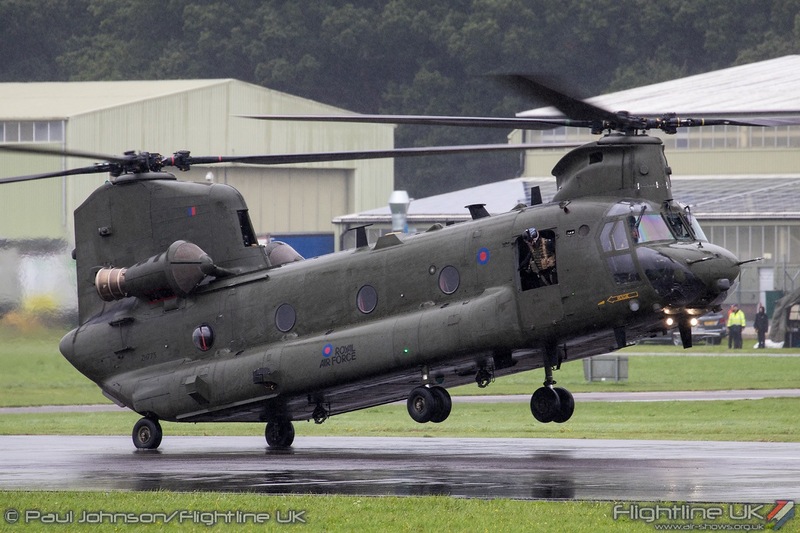 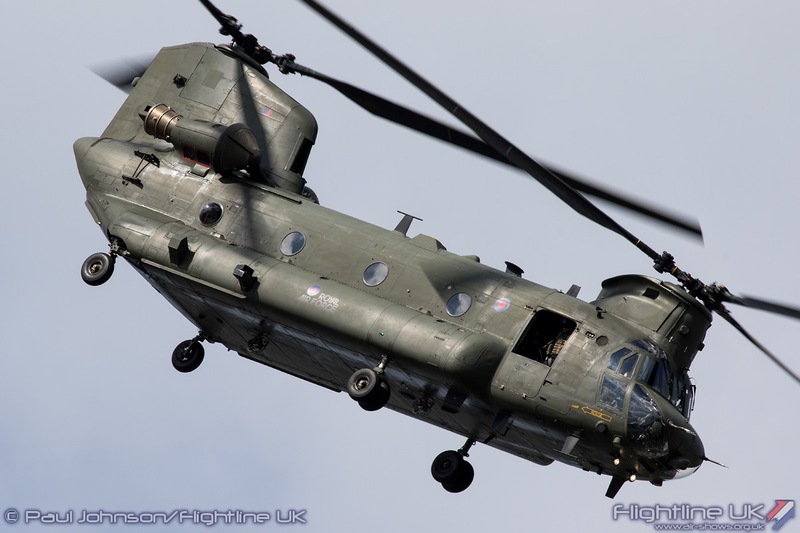 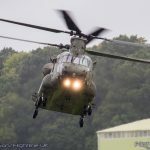 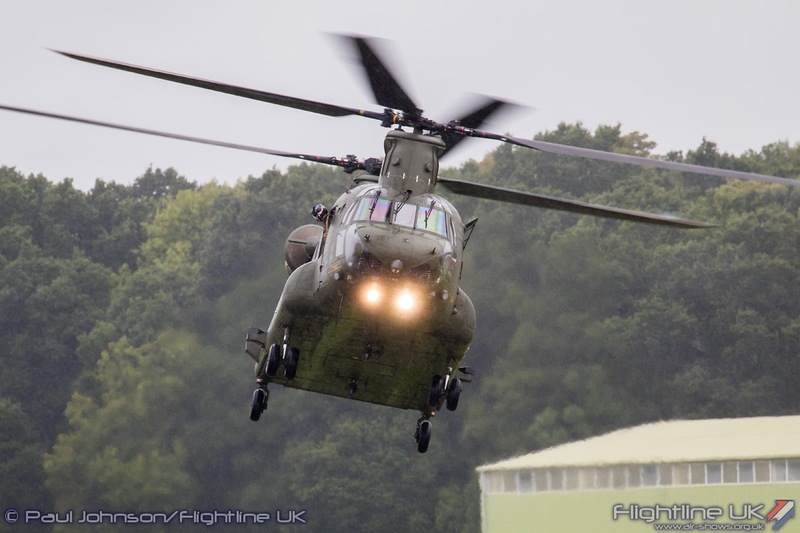 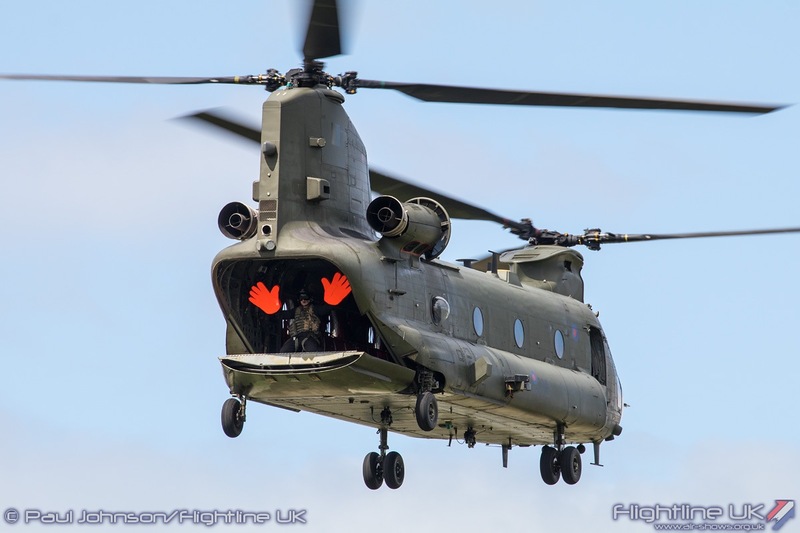 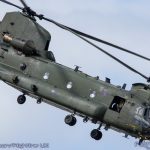 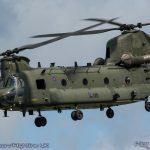 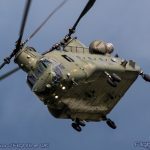 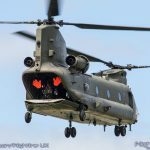 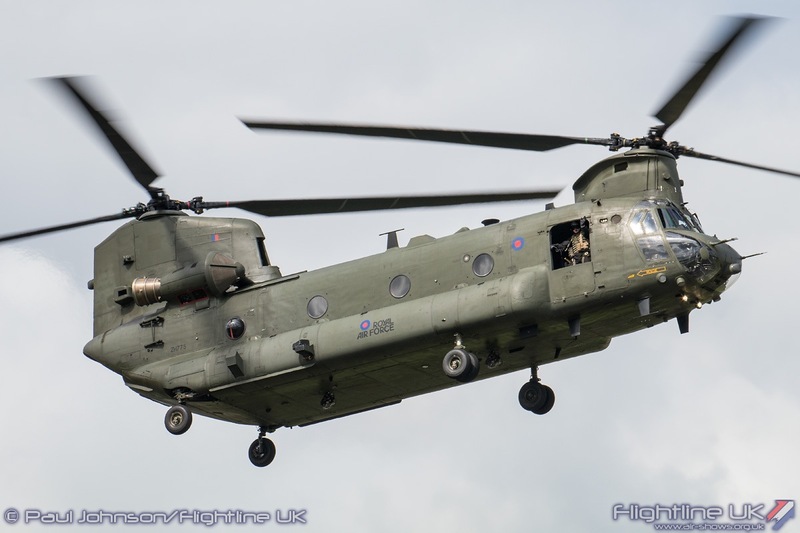 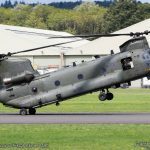 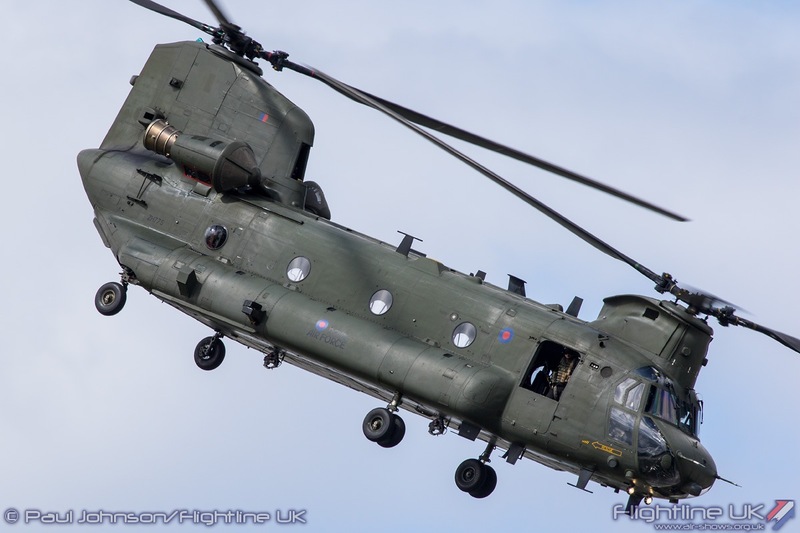 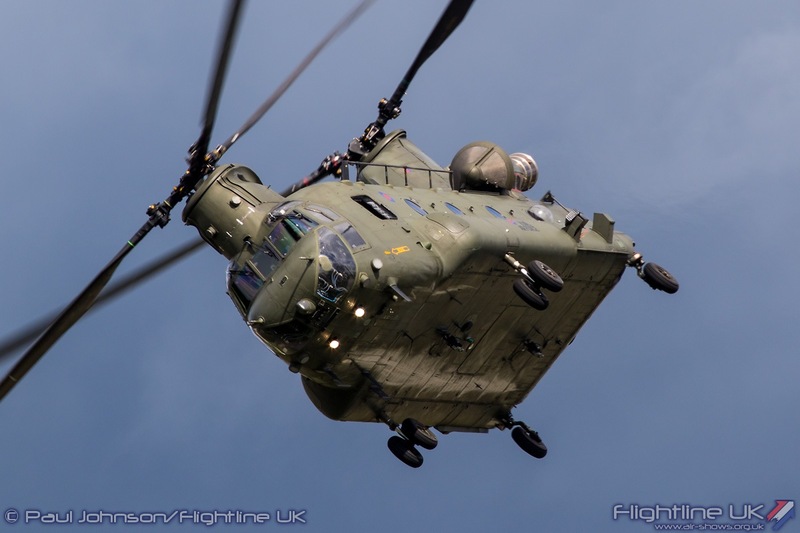 The RAF Odiham based Chinook force is a regular visitor to Dunsfold airfield using it for training. 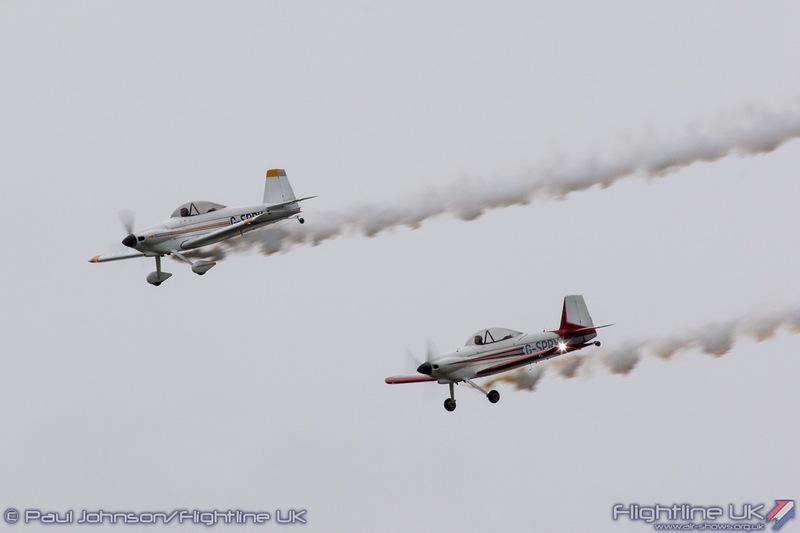 Notably during periods of Snow they use it to train in “white-out” conditions as much of the airfield is not cleared. 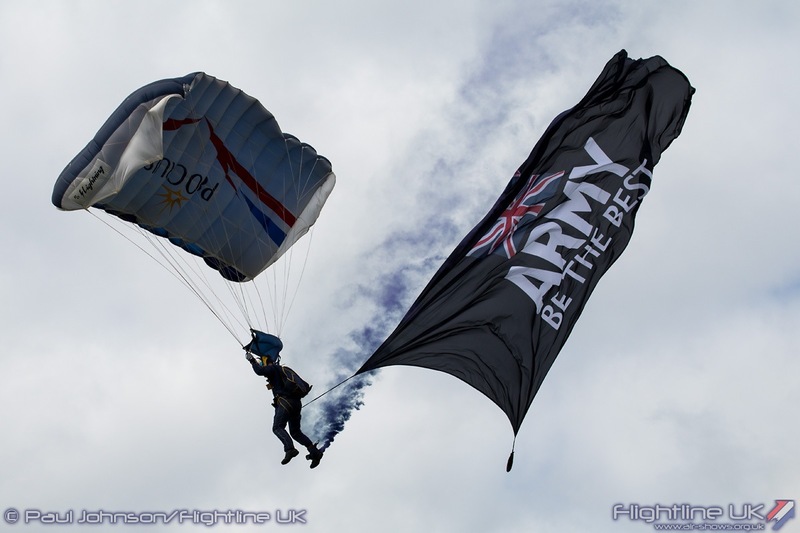 Another military unit that has local links to Dunsfold is the Princess of Wales Royal Regiment of the British Army. 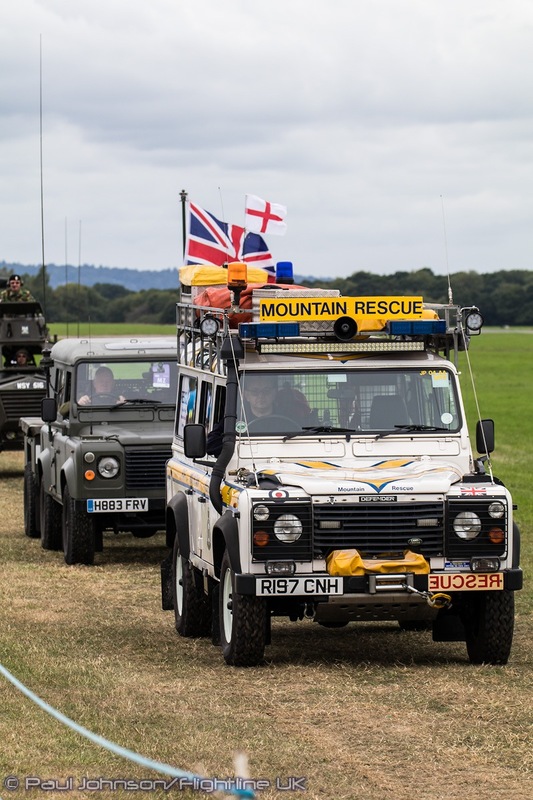 The PWRR recruit from the South East of England and are based at Barracks across the UK, Germany and Cyprus. 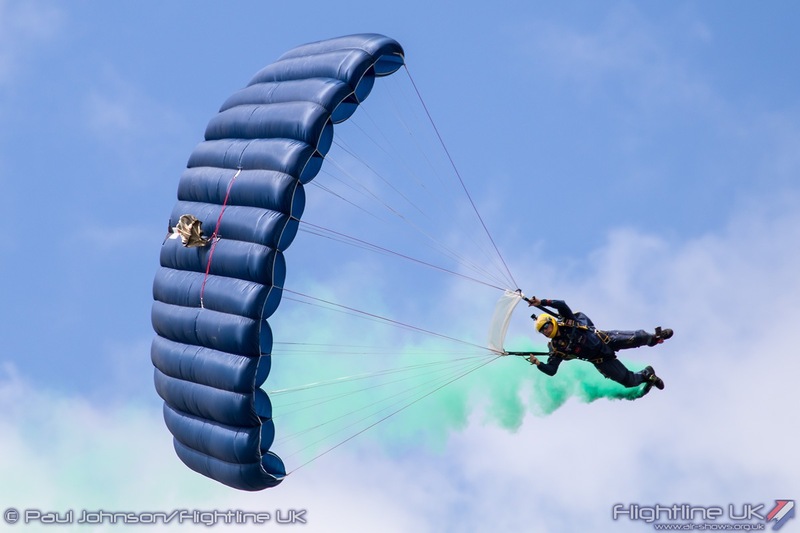 They are also the parent unit for the Tigers Freefall Parachute Display Team. 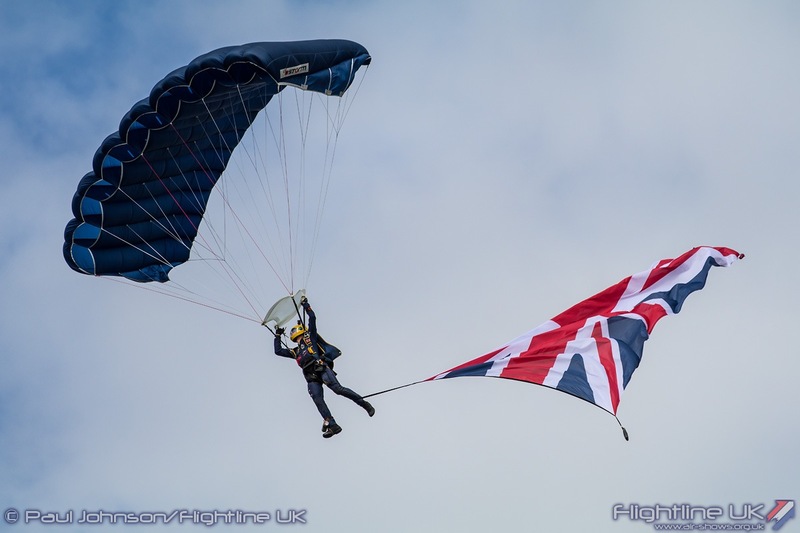 The team have recently become an official Army Parachute Team which affords them official funding and the ability to travel to California for winter training. 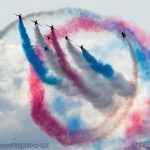 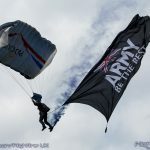 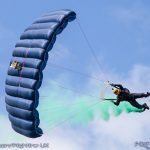 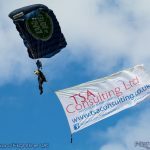 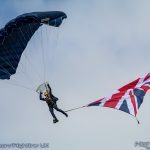 With limited airspace, Dunsfold is right on the limits for parachute displays but the team put on a very impressive display of parachuting as they always have done at Dunsfold. 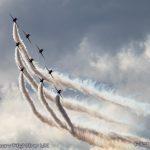 The highlight of the afternoon was of course the Red Arrows for all the same reasons they are the main event at any other show plus more. 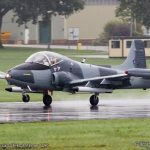 Dunsfold is very much a home for the Hawker Sidderley (now BAE Systems) Hawk T1 which the team fly as it was at the airfield that Duncan Simpson performed the first flight in 1974. 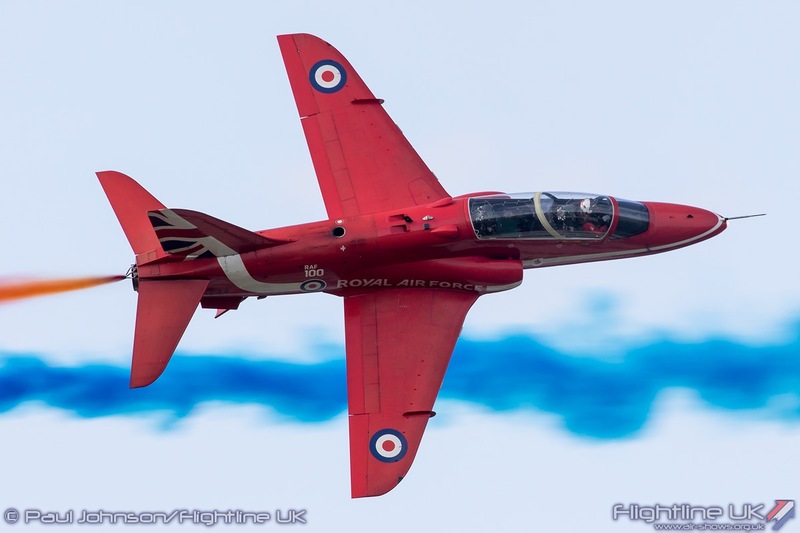 Over 40 years later, that same design still plays a major role in military training with 100 Sqn at RAF Leeming, 736 Naval Air Squadron at RNAS Culdrose and represents the “Best of British” with the Red Arrows. 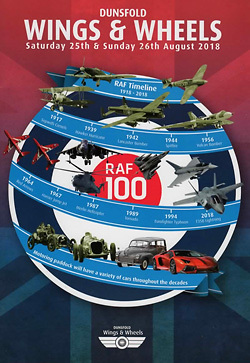 The teams display is there perhaps the ultimate salute to successful designs and test work that took place out of Dunsfold right up until BAE Systems left the site in 2000. 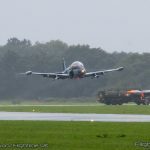 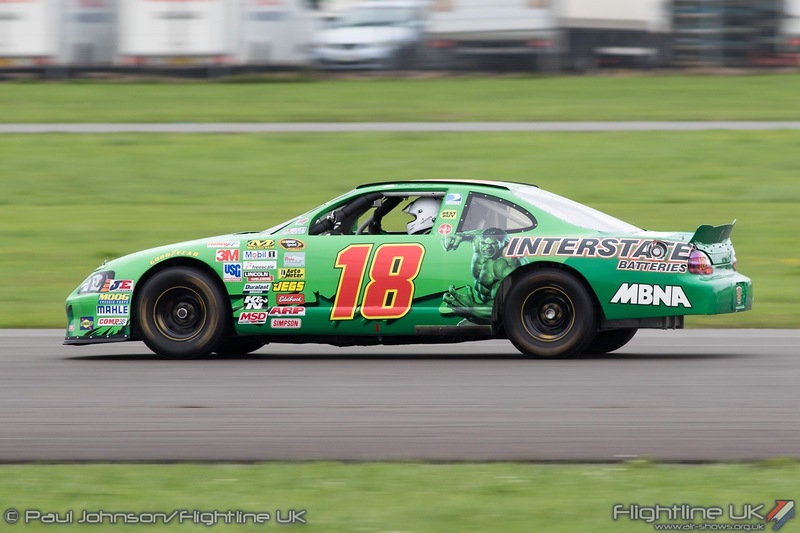 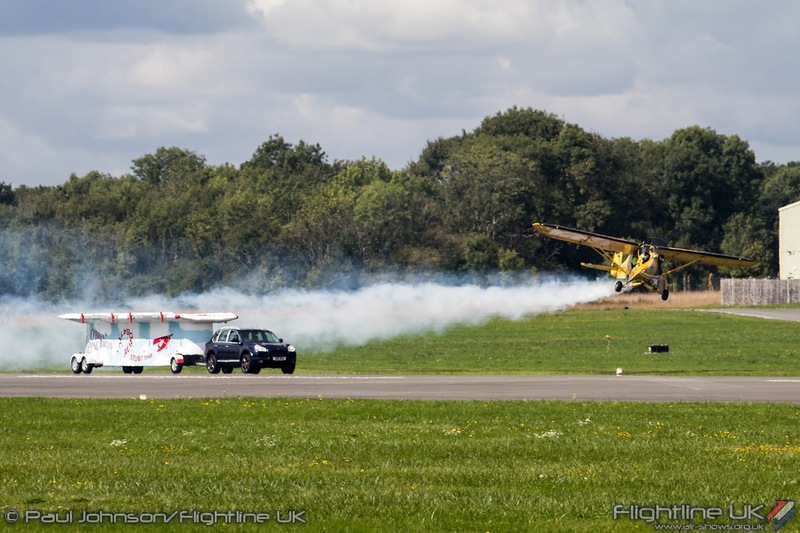 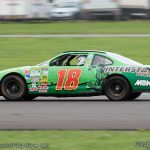 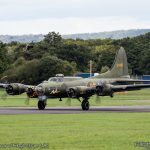 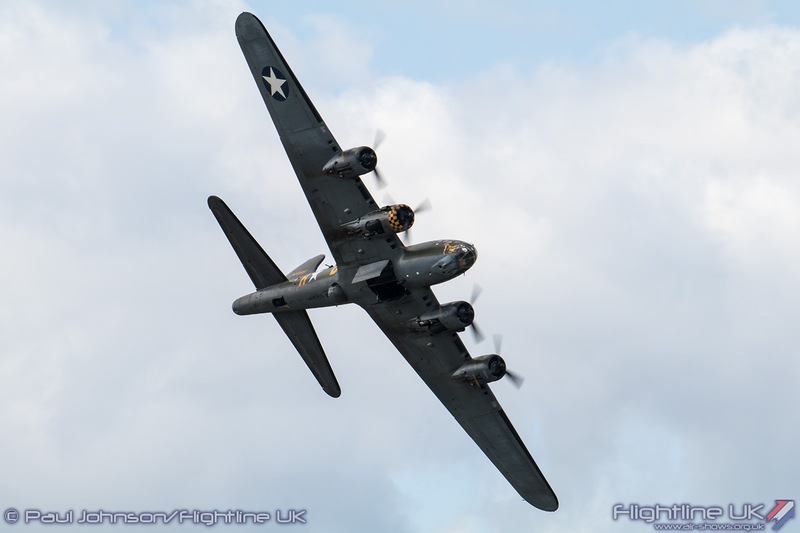 It was a huge shame Dunsfold was forced to end early due to the poor weather. 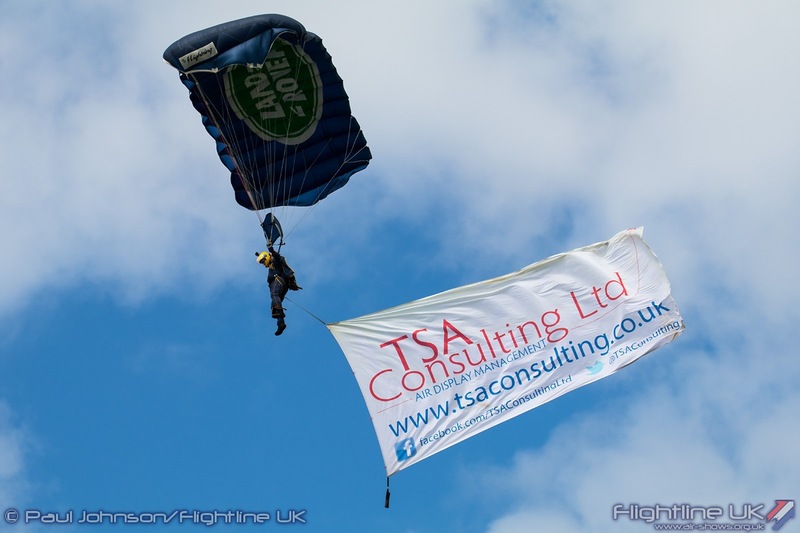 Saturday saw the event at its best with some wonderful motoring displays and some great flying in a relaxed atmosphere. 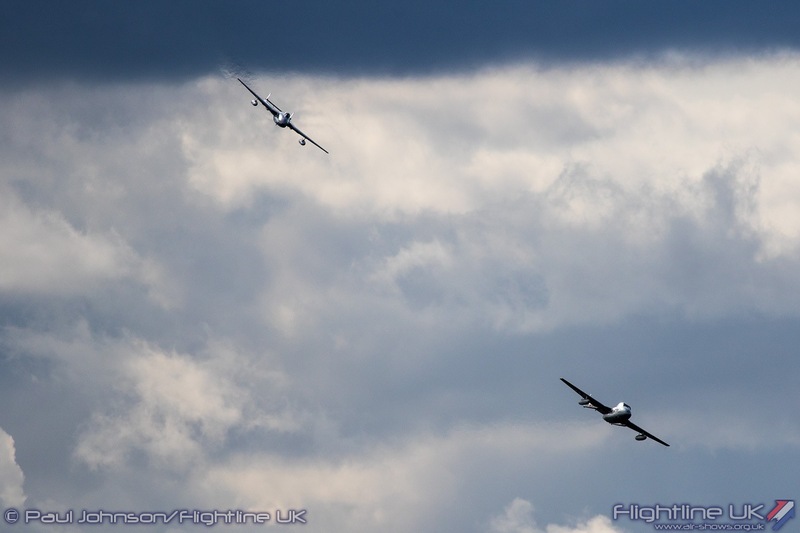 Above all however, Dunsfold is pure motoring and aviation fun at its best.